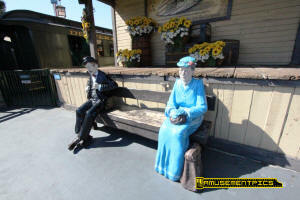 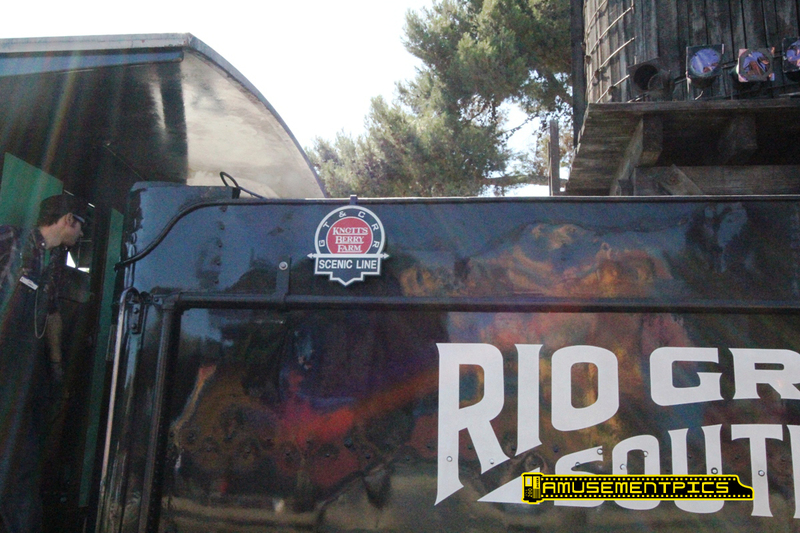 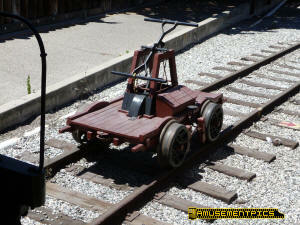 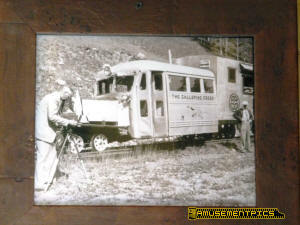 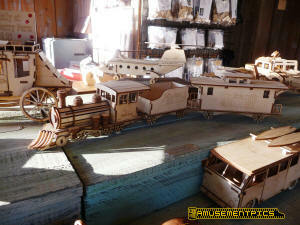 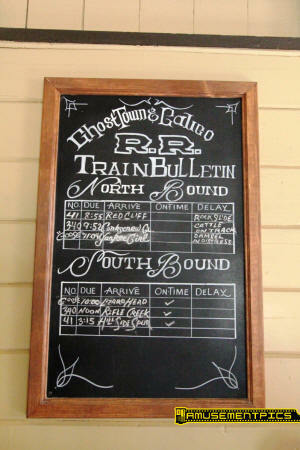 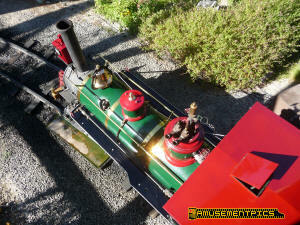 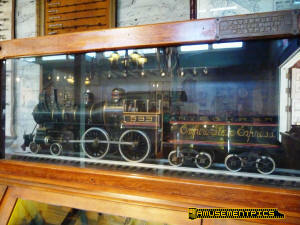 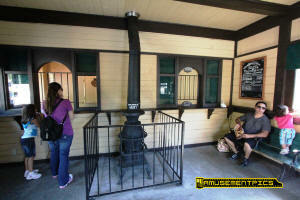 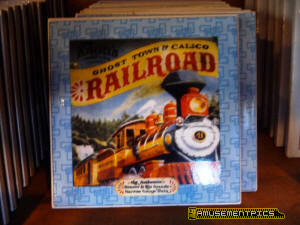 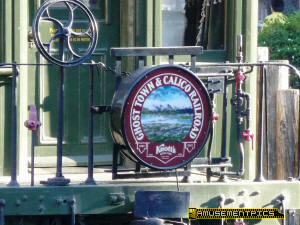 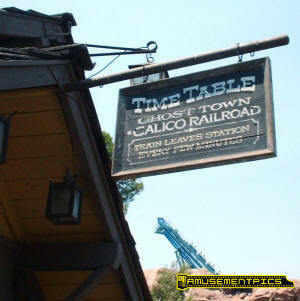 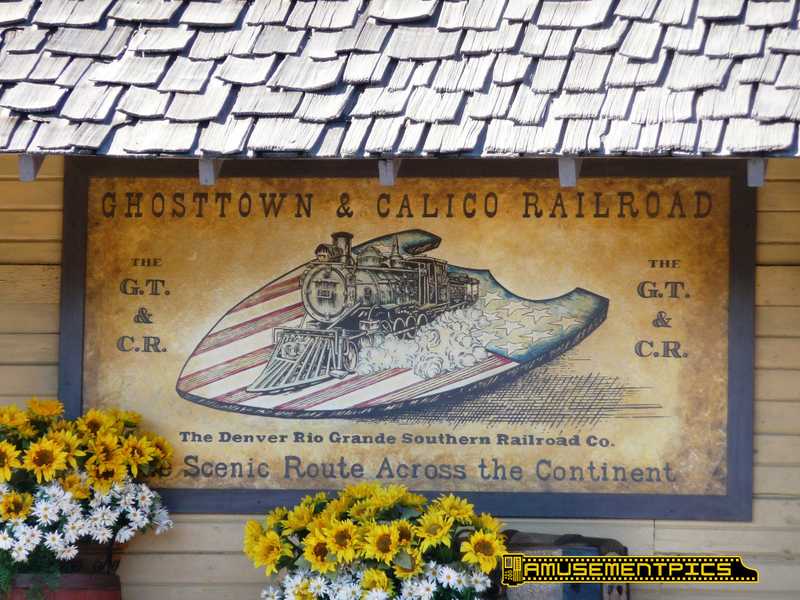 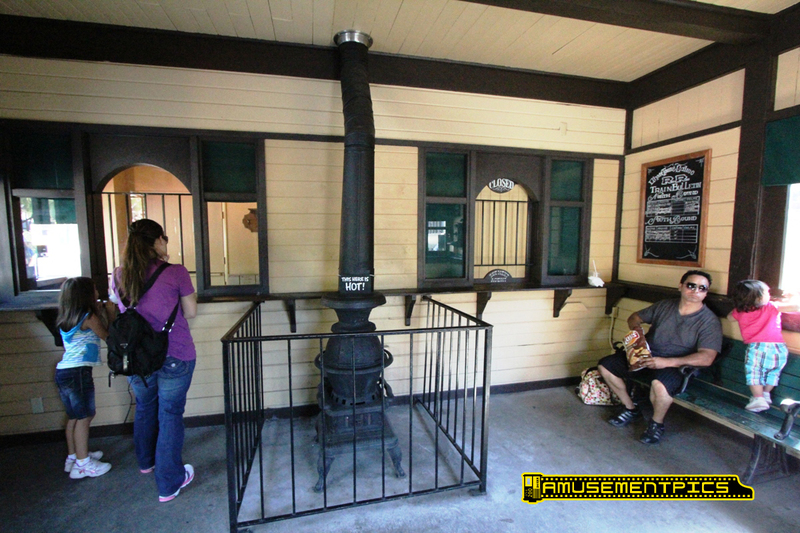 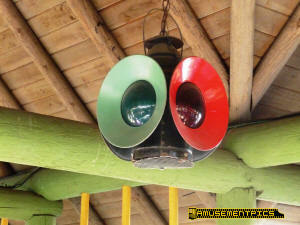 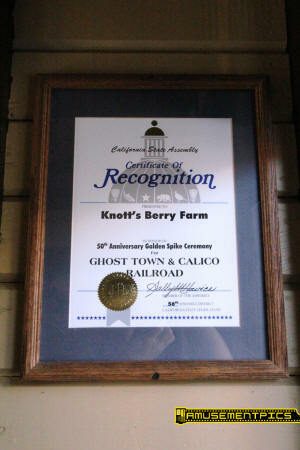 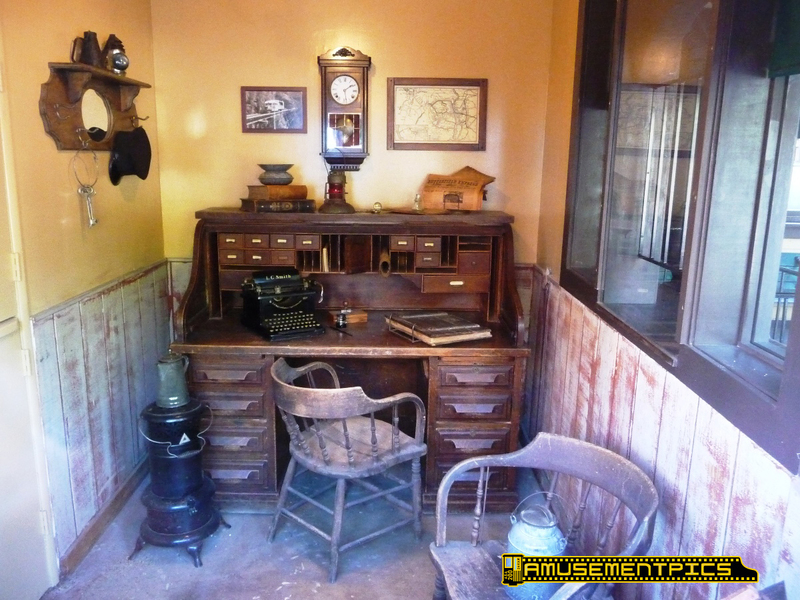 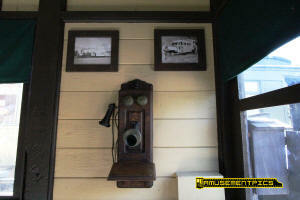 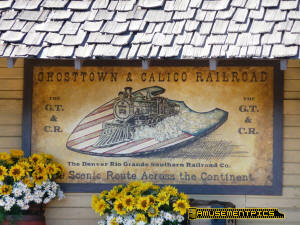 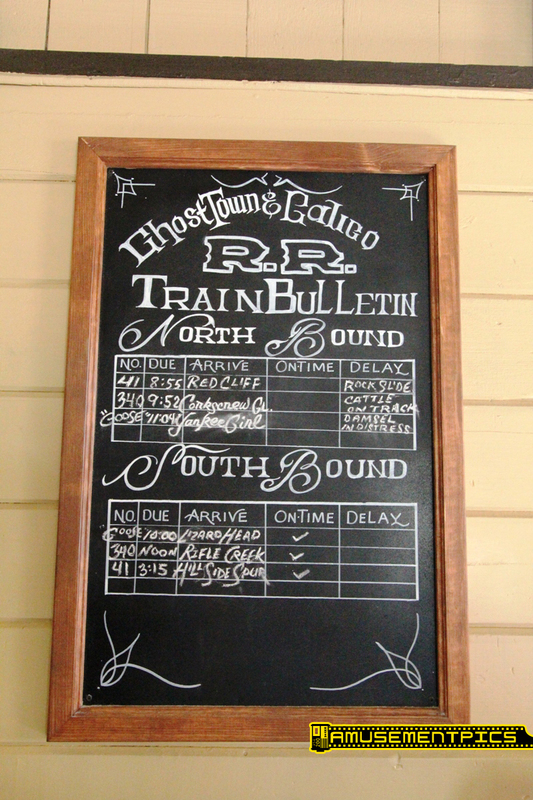 The Ghost Town & Calico Railway celebrated its 60th anniversary in 2012. 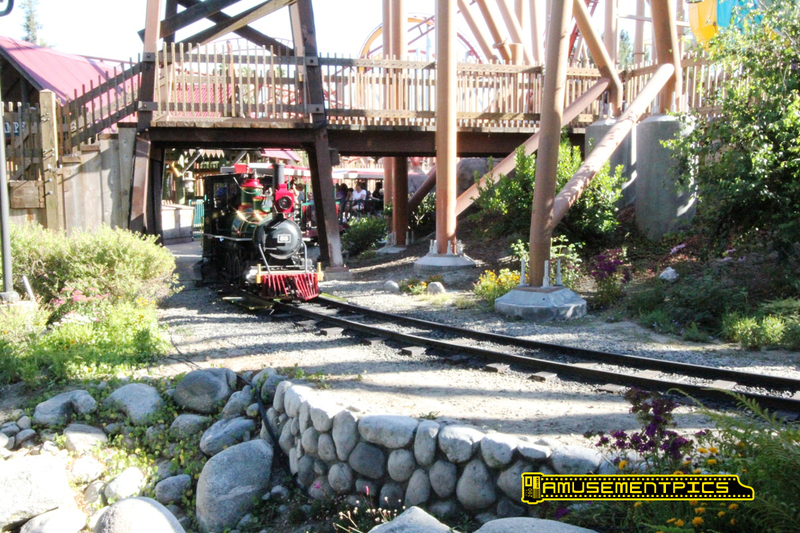 The narrow gauge layout circles a portion of the park, and was opened January 12, 1952. 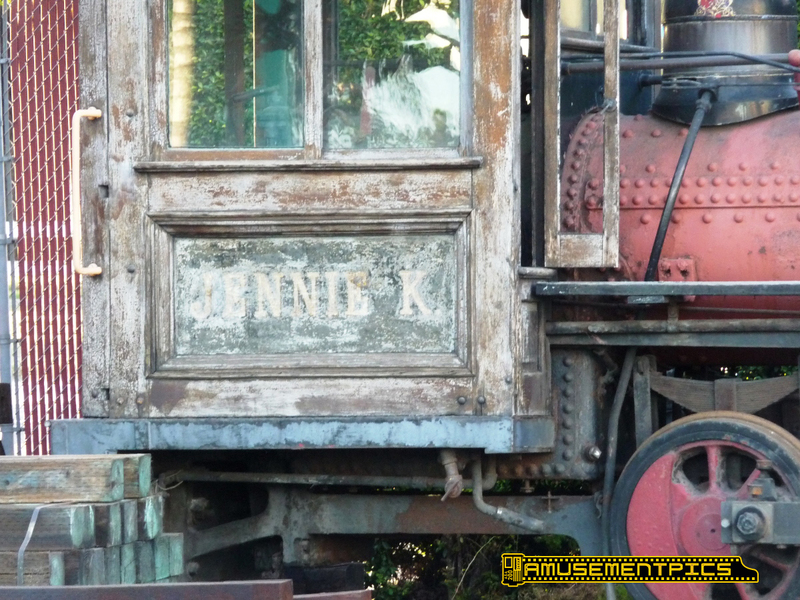 The Jennie K. is a 1940 H.K. 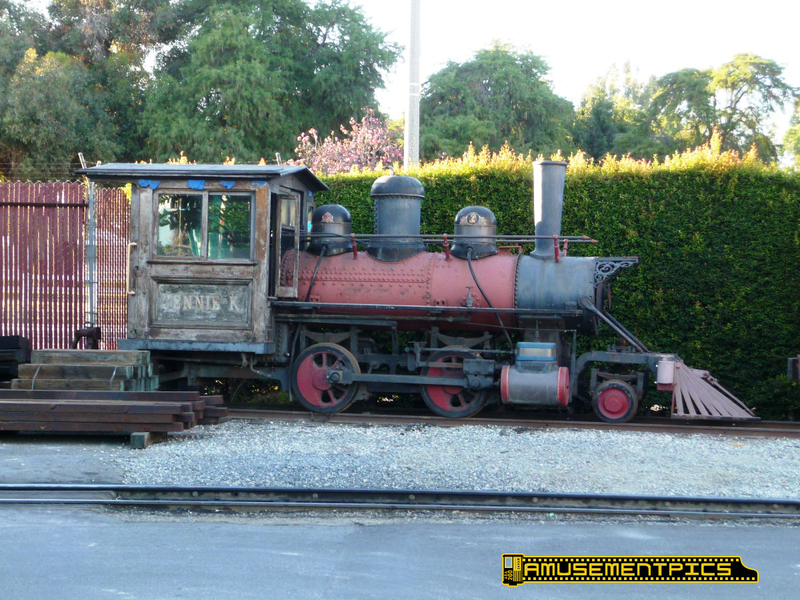 Porter locomotive originally built as an 0-4-0 tank engine for the Acme Brick Company. 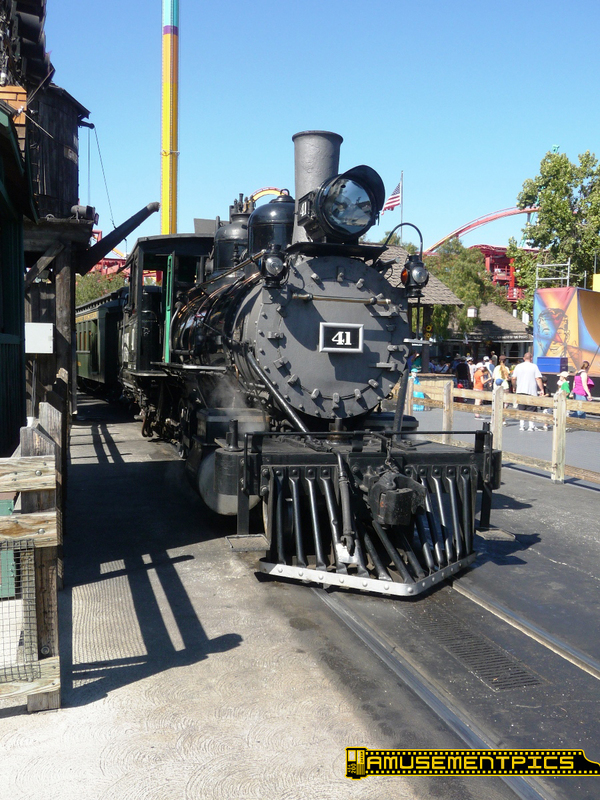 The engine was acquired by Cedar Point from 1964 through the 1980's when it was taken out of service. 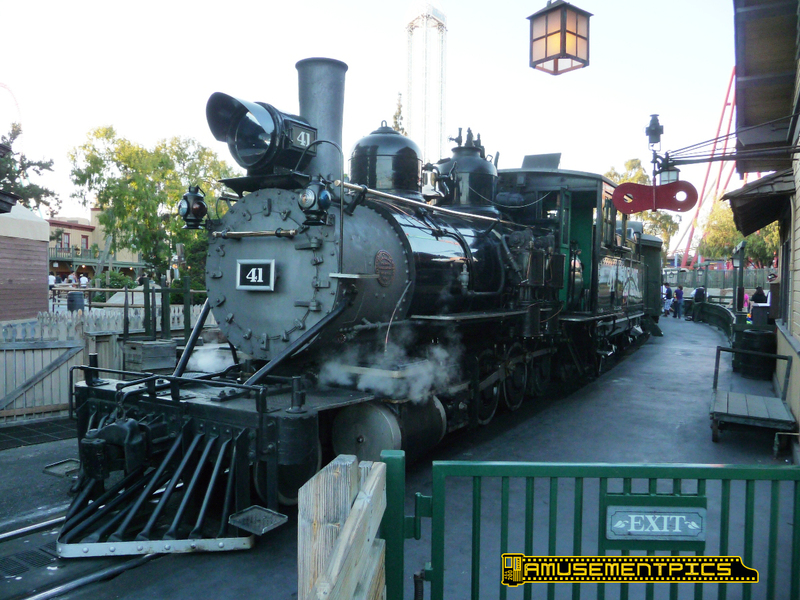 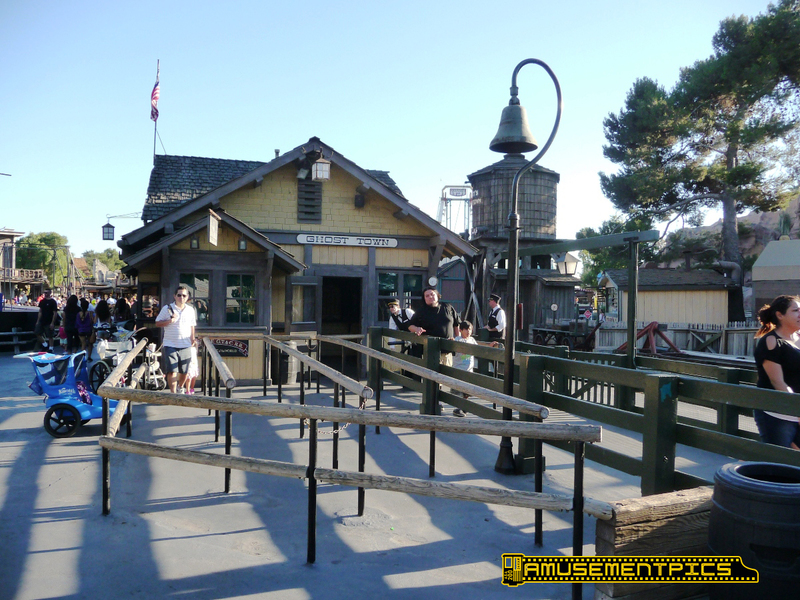 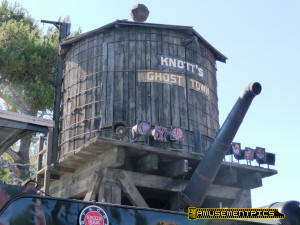 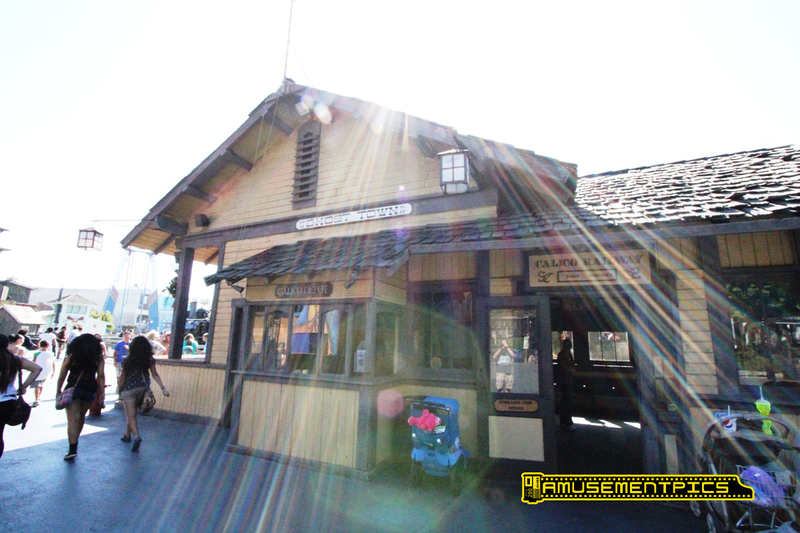 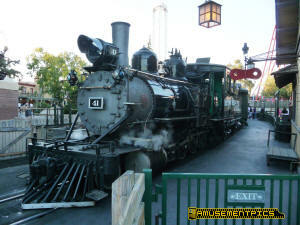 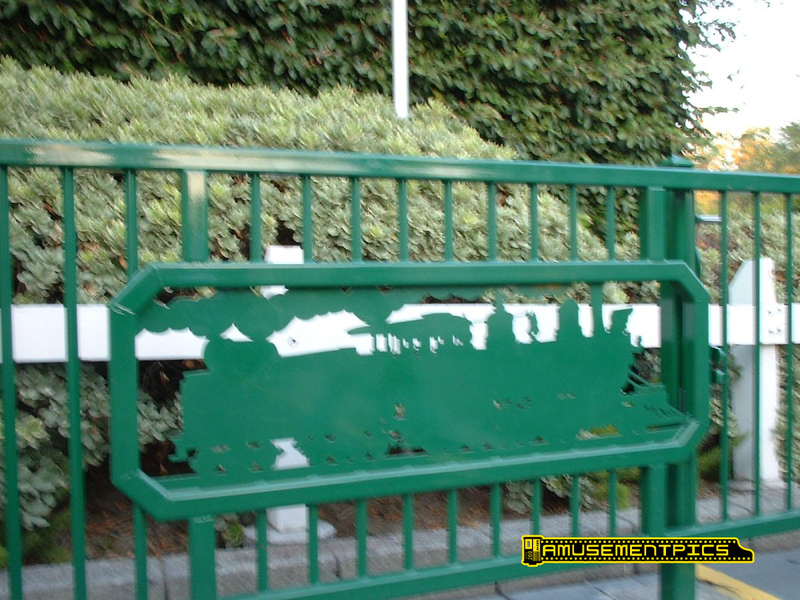 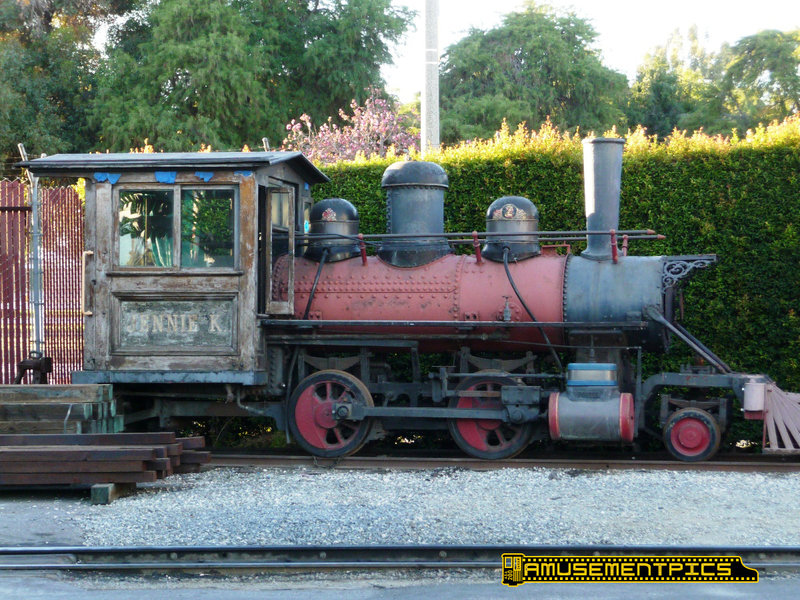 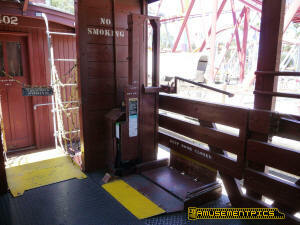 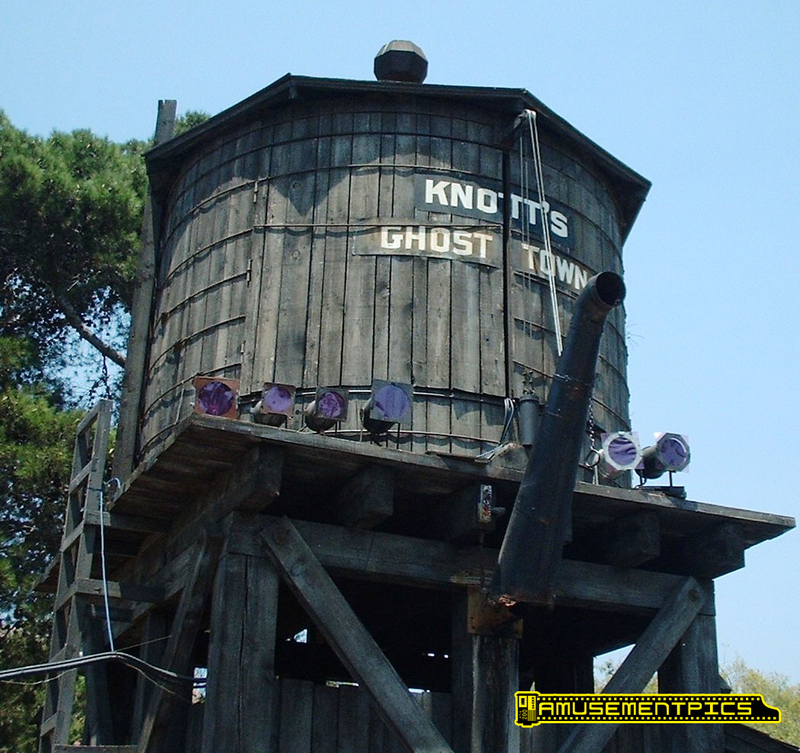 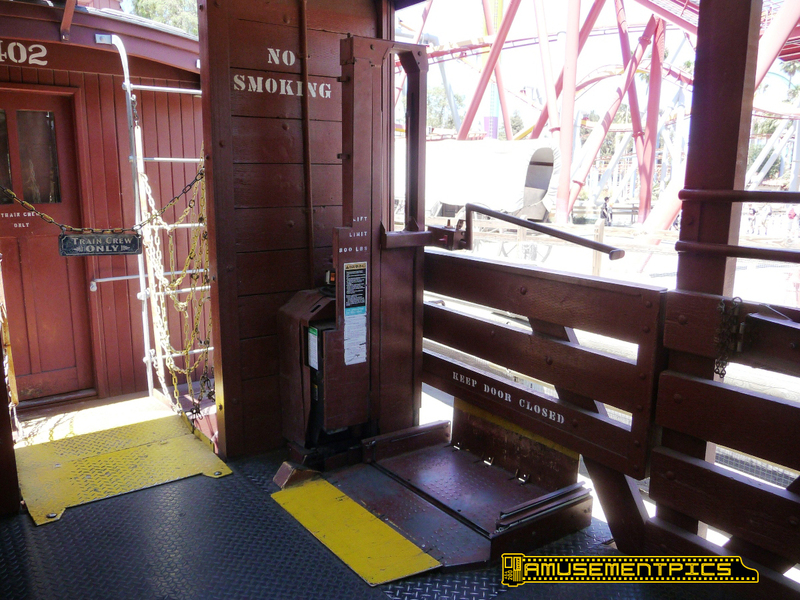 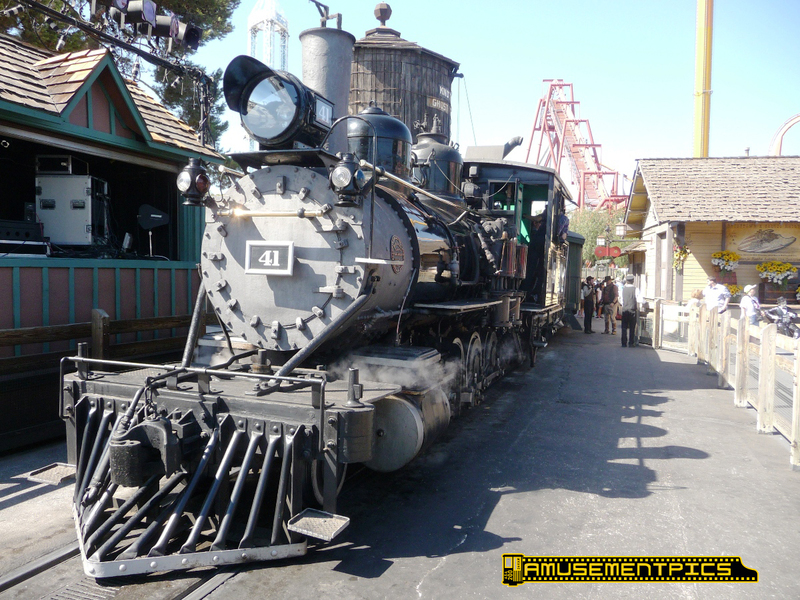 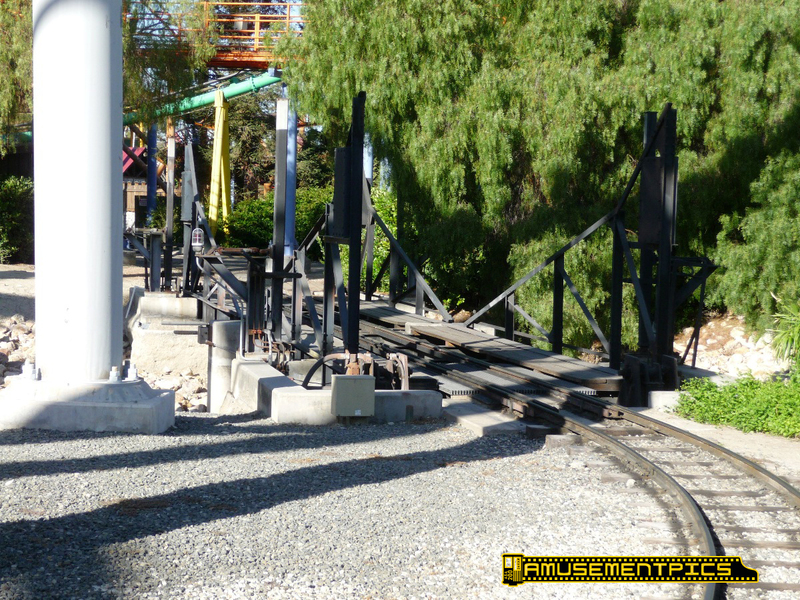 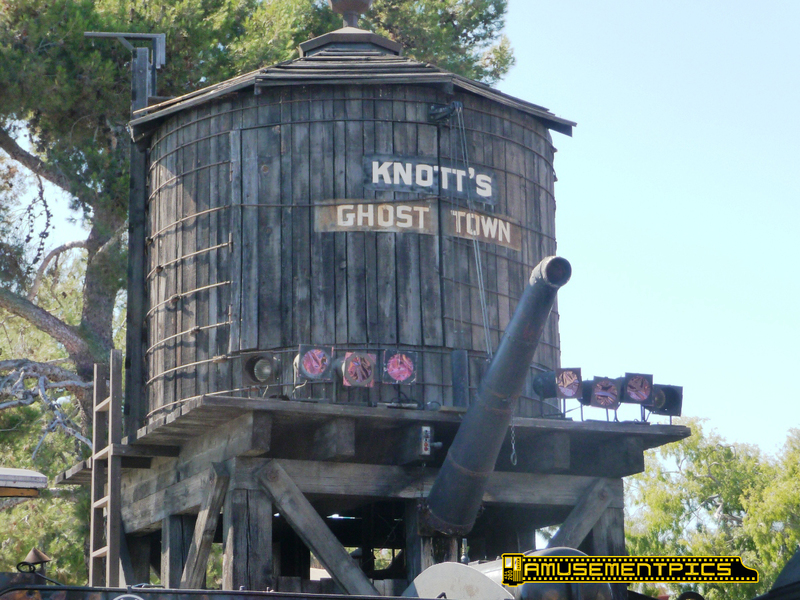 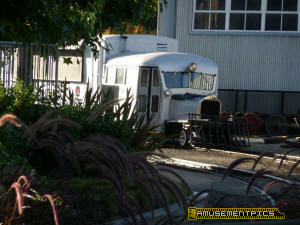 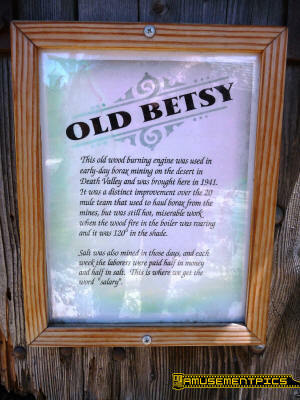 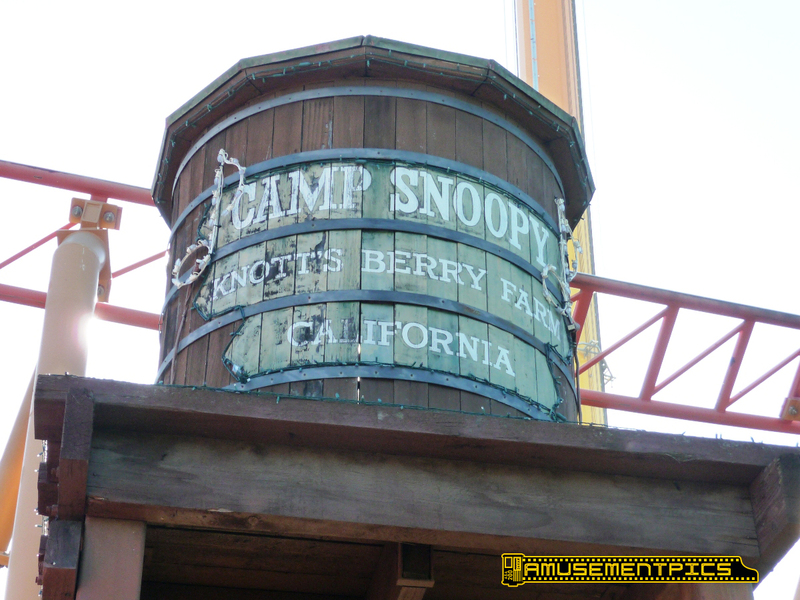 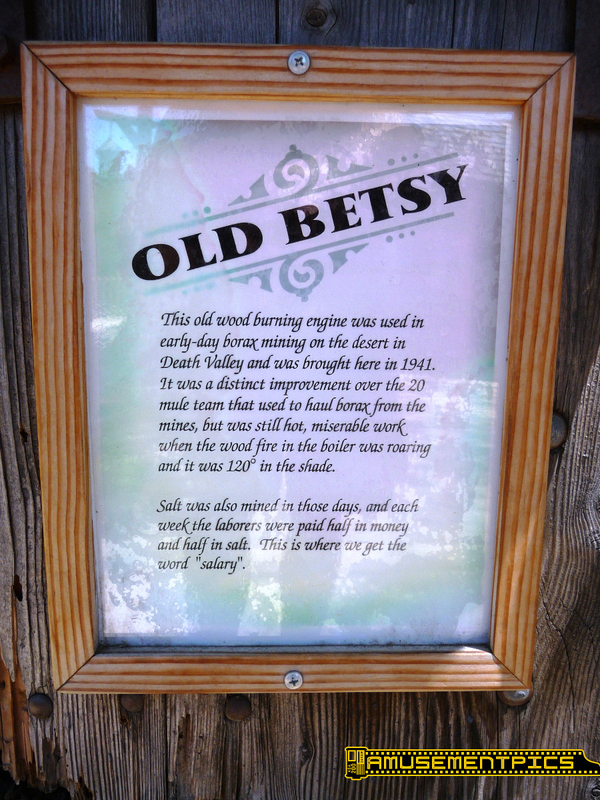 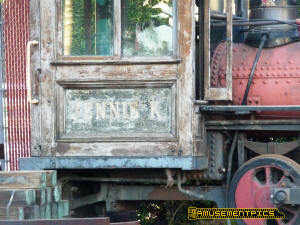 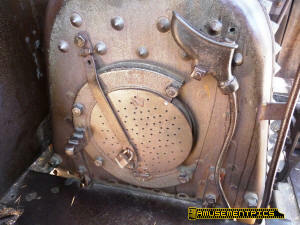 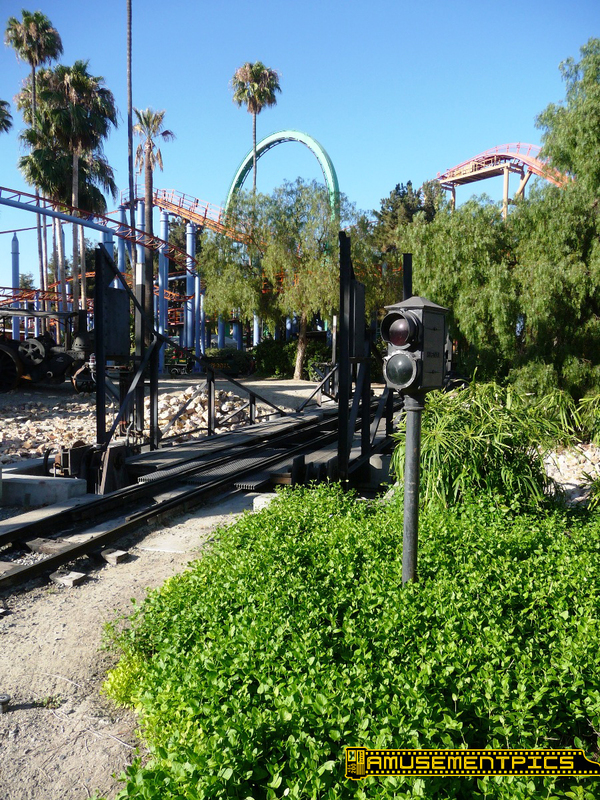 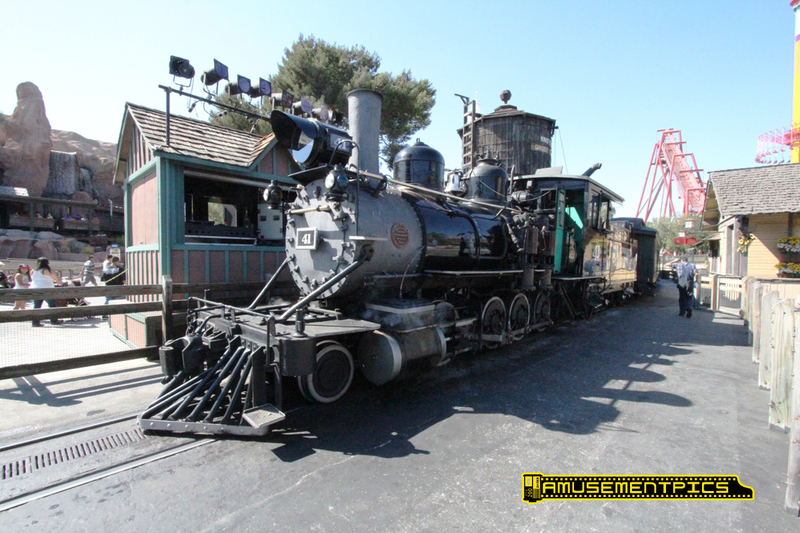 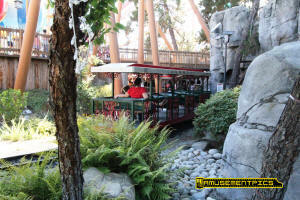 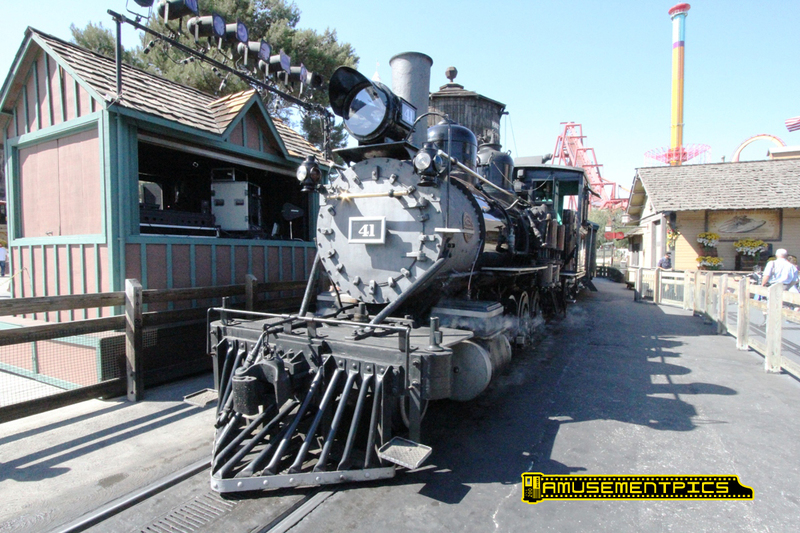 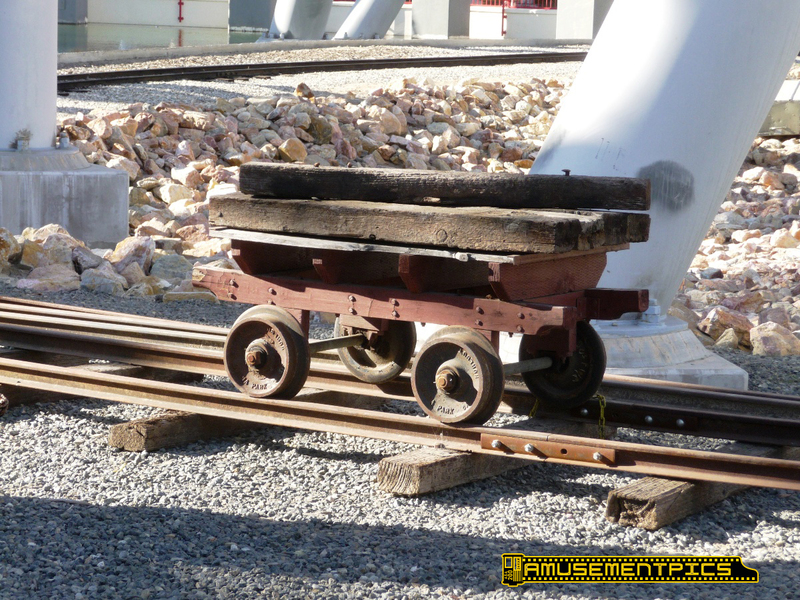 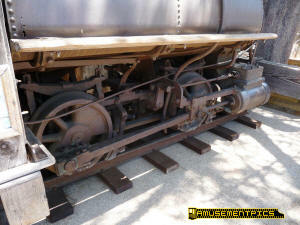 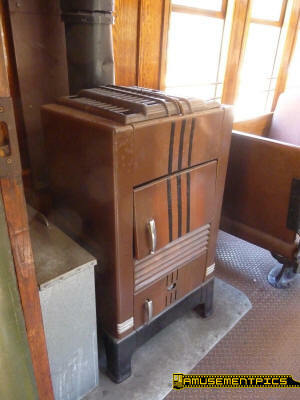 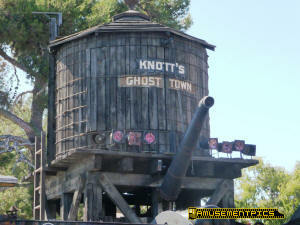 It was moved to Knott's in 2010 where it is expected to be restored to service at some point. 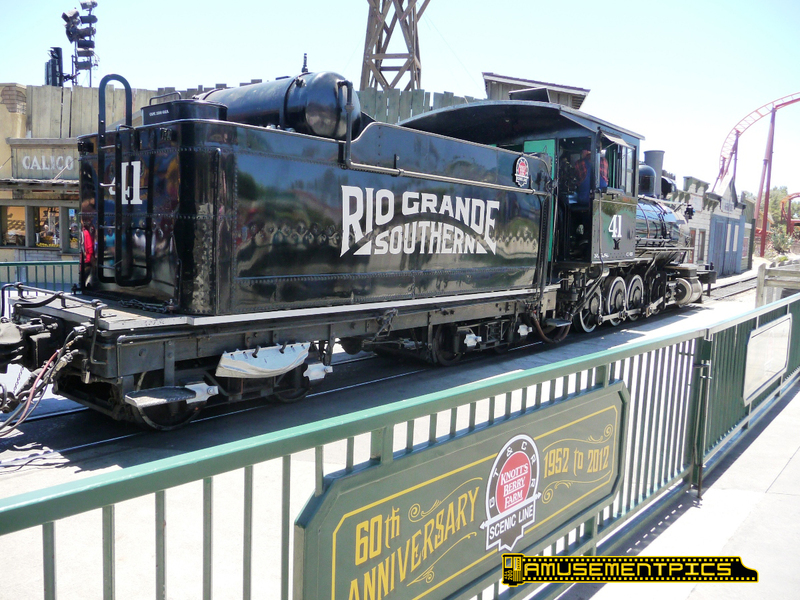 Galloping Goose #3 was a rail bus built for the Rio Grande Southern in the 1930's to transport mail as well as to offer passenger service on the less traveled lines. 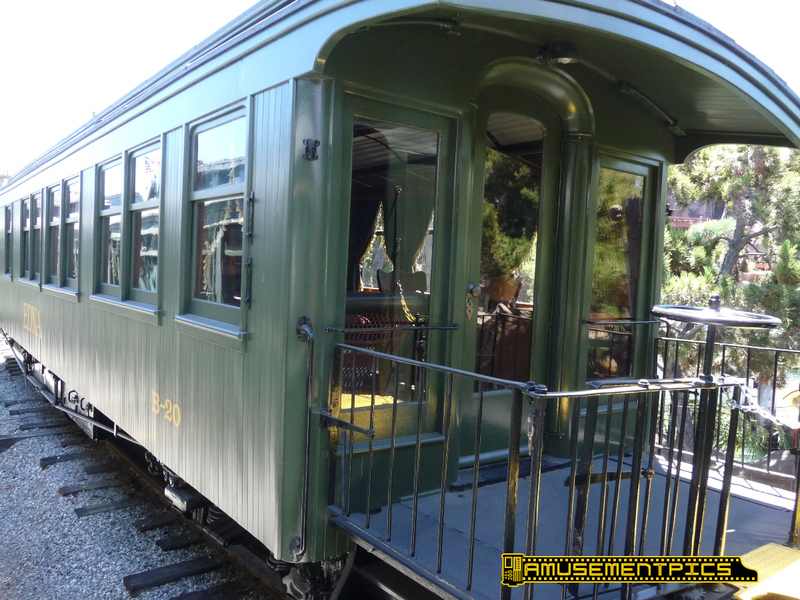 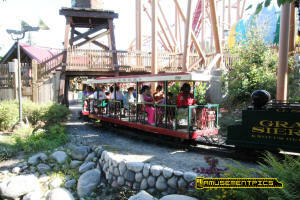 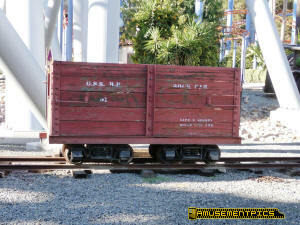 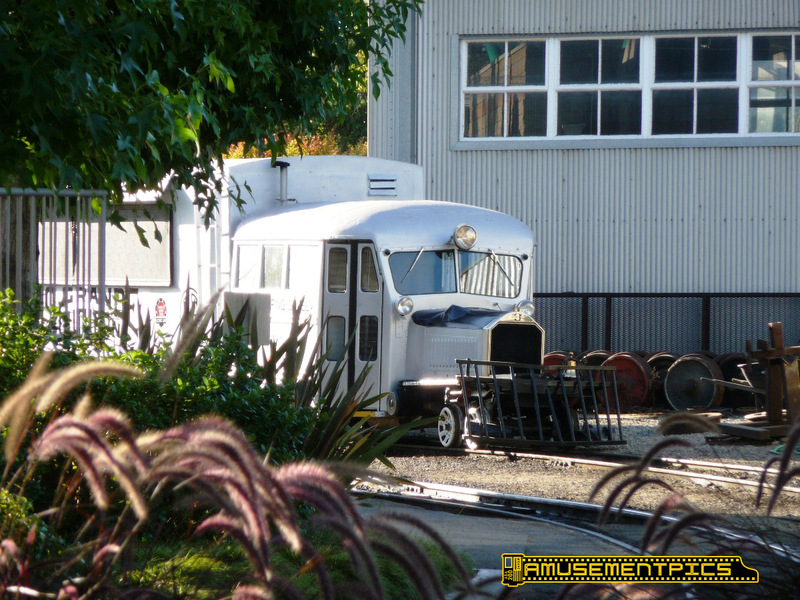 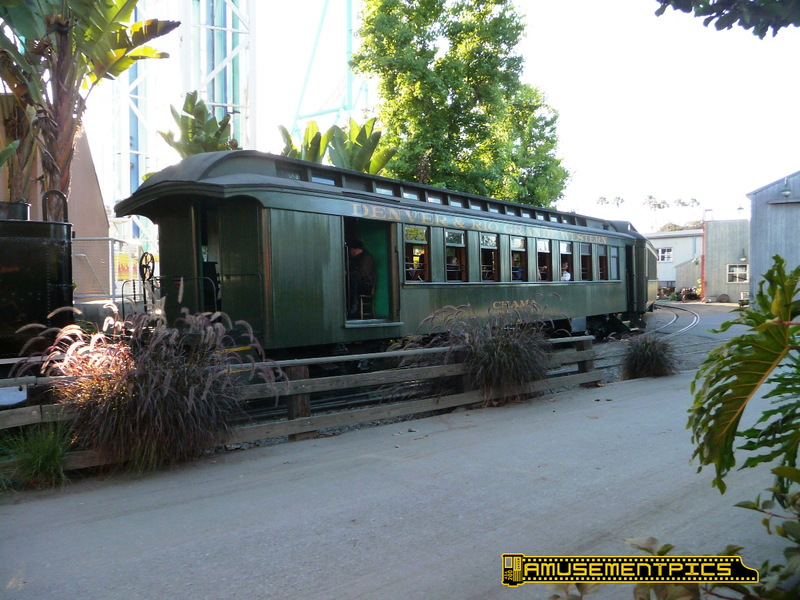 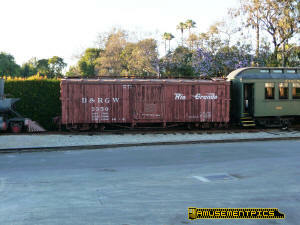 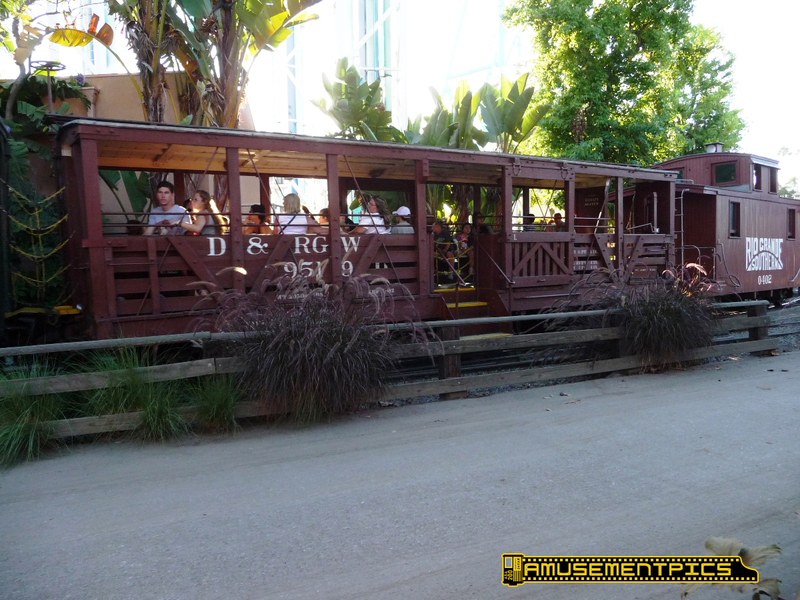 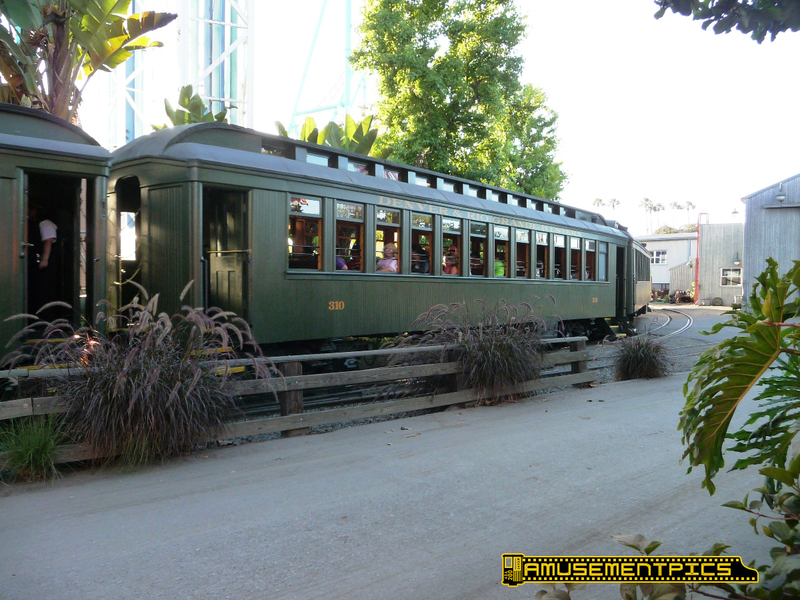 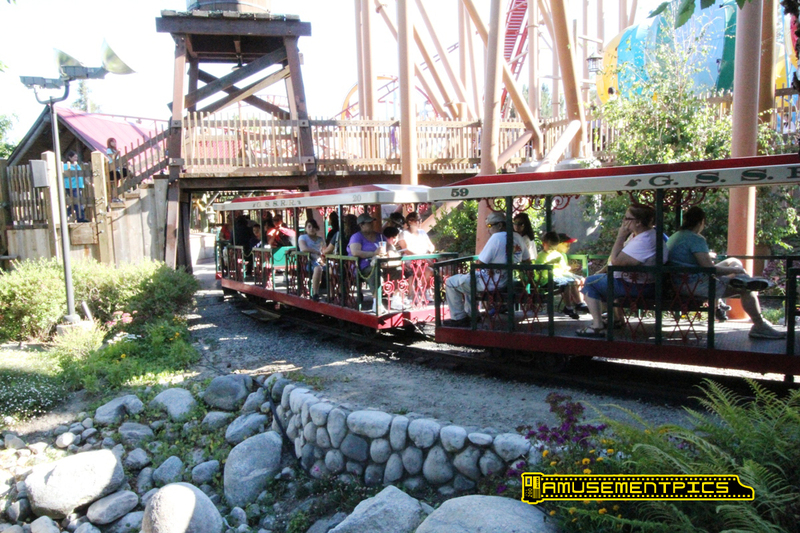 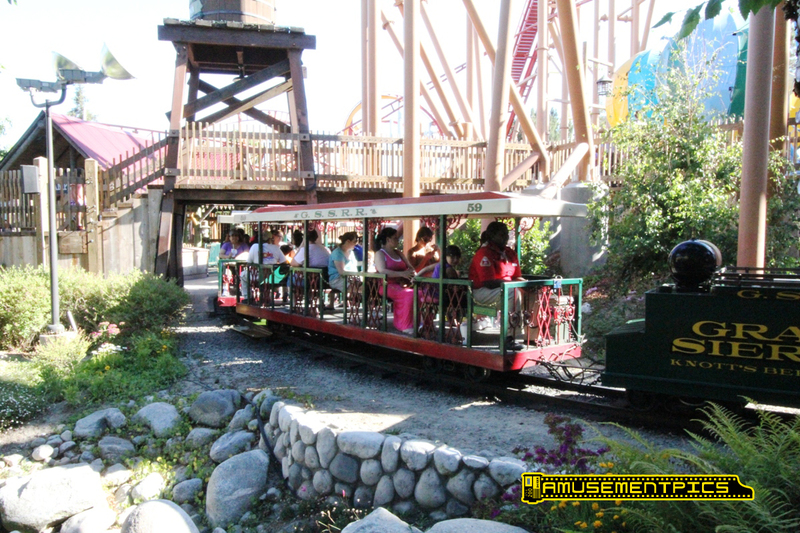 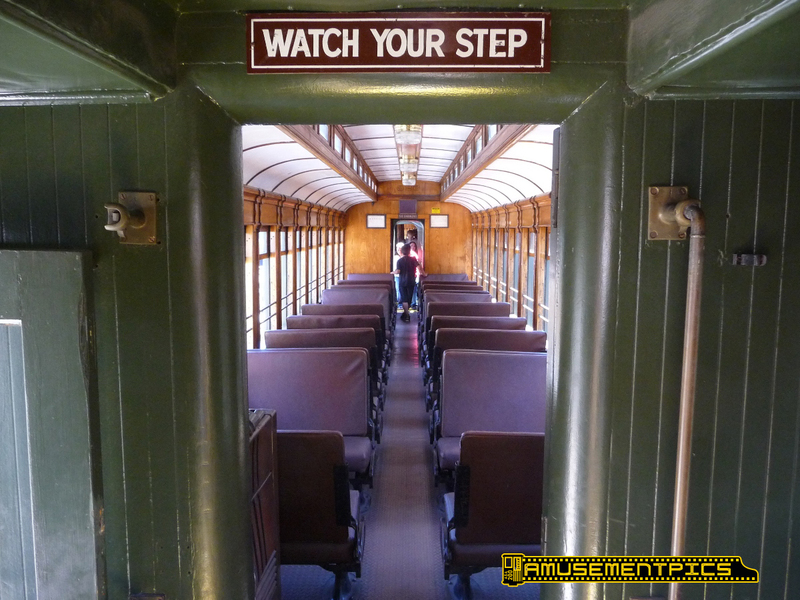 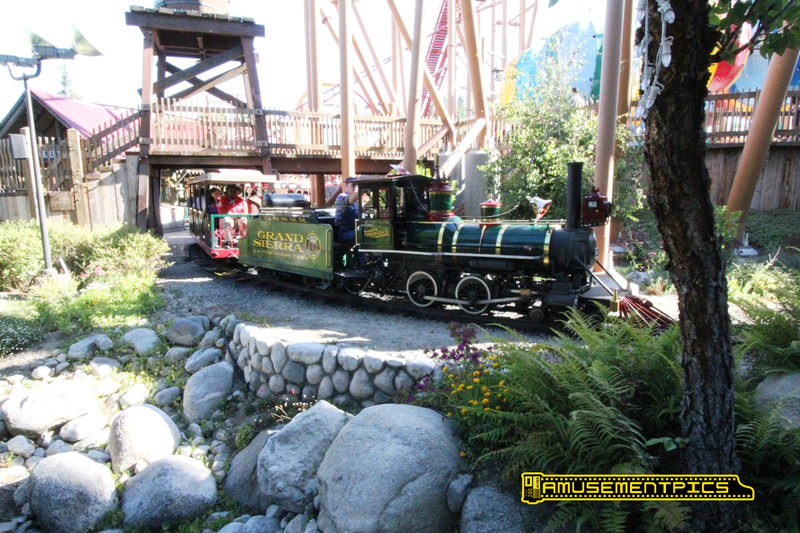 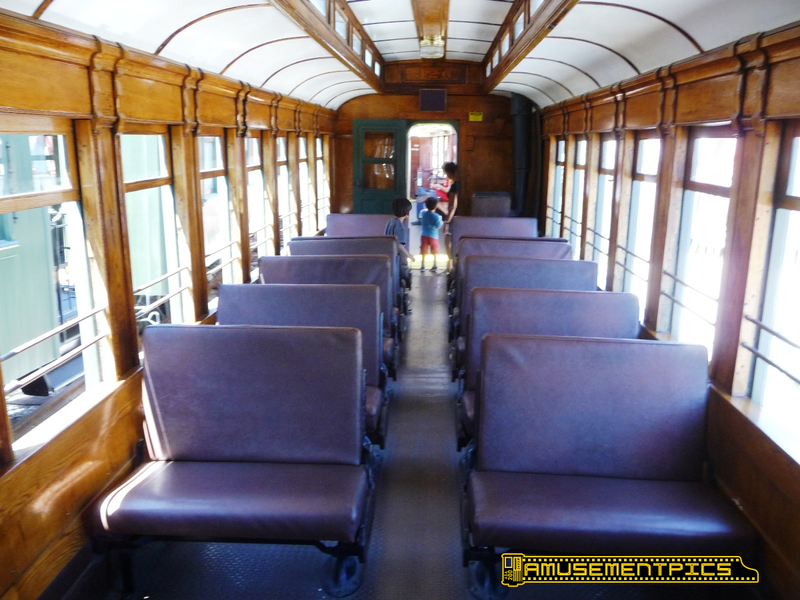 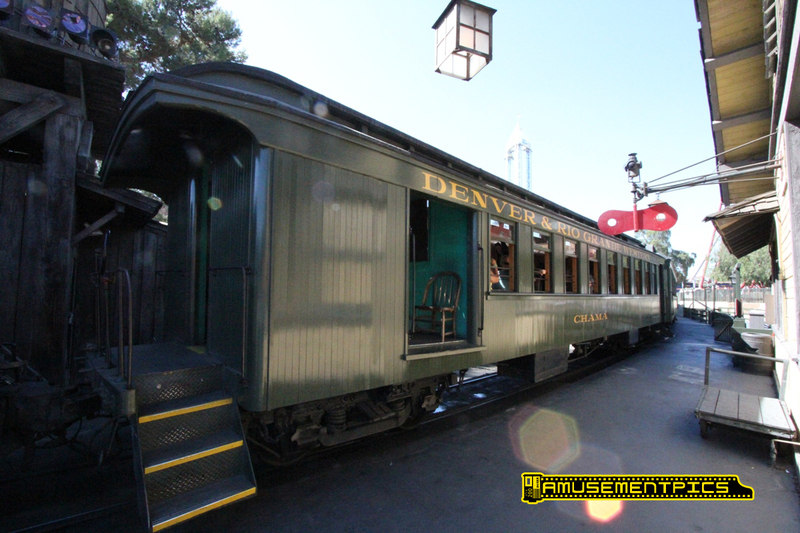 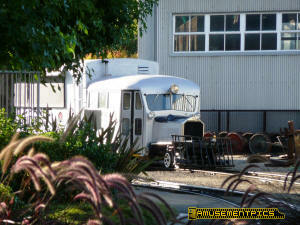 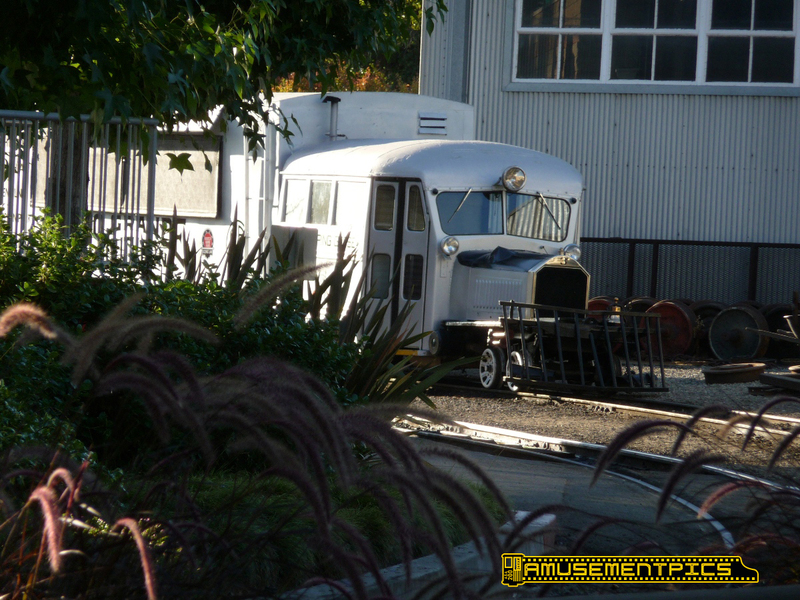 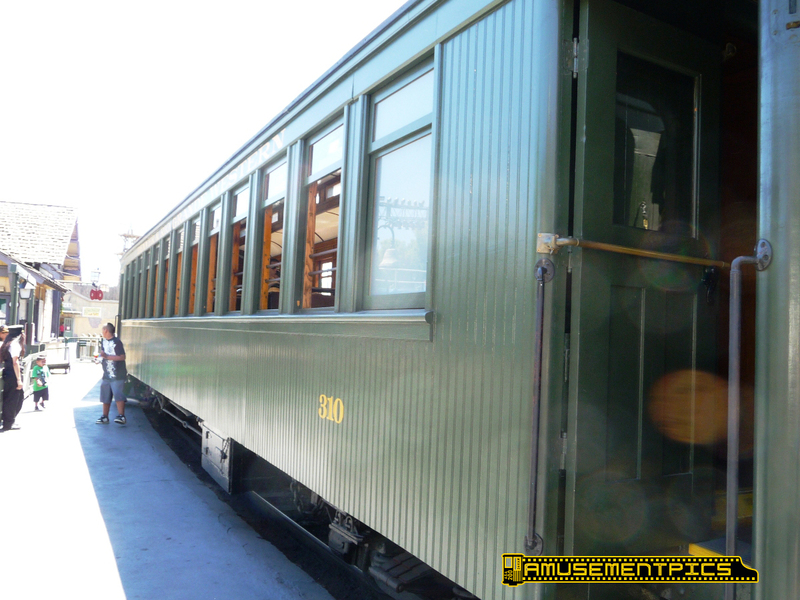 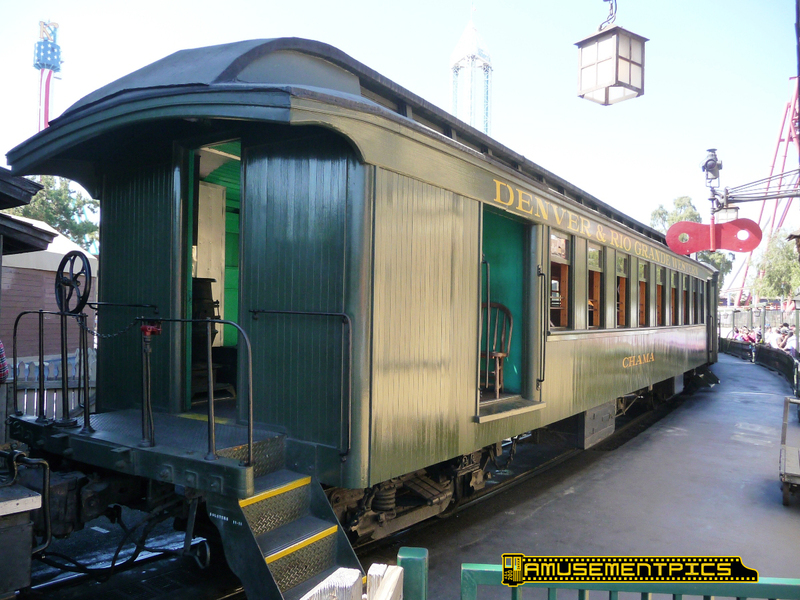 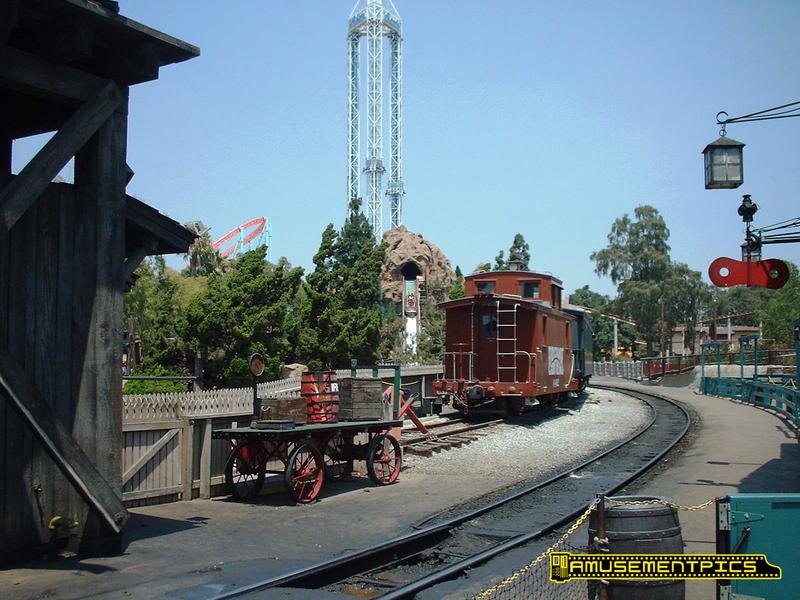 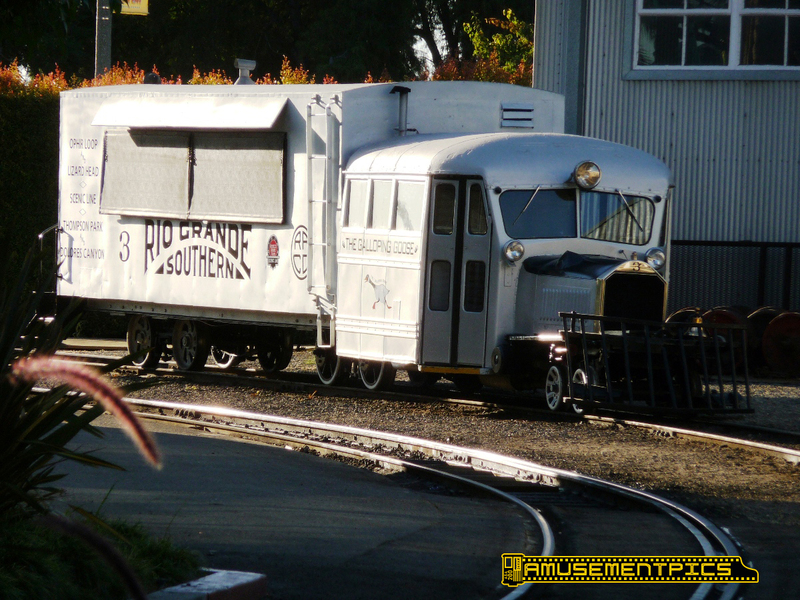 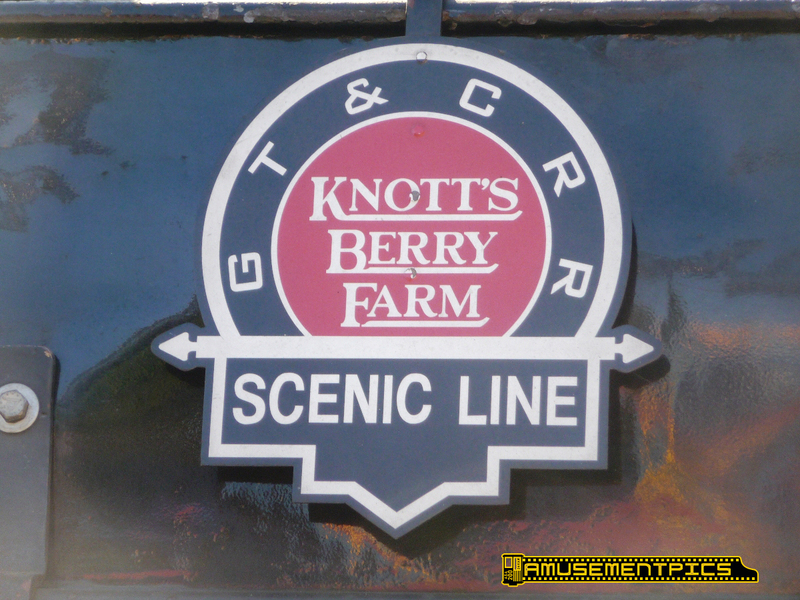 The vehicle was acquired by Knott's along with the other rolling stock and engines in the 1950's, and is used on slower days for passenger service. 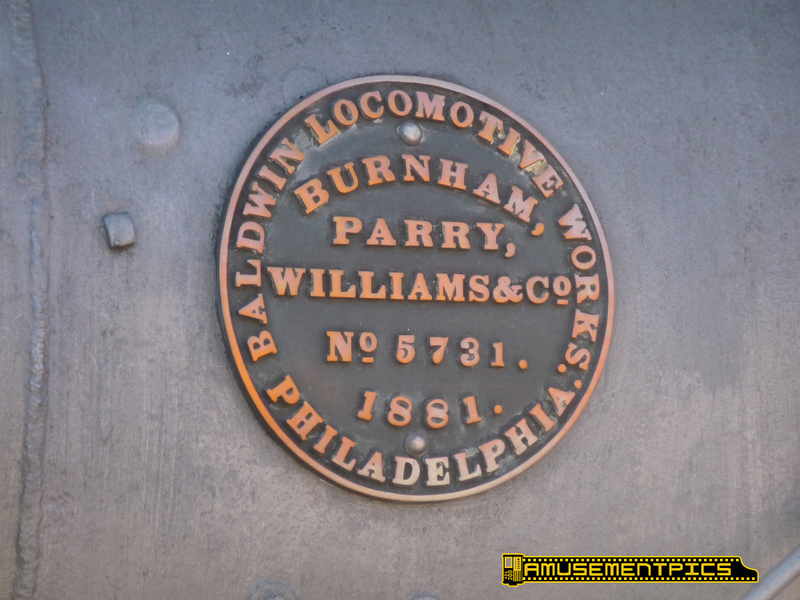 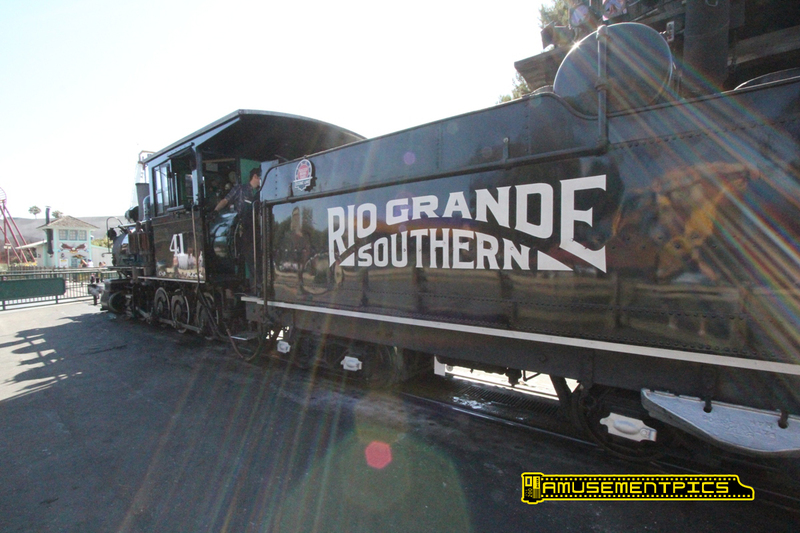 One of two Class C-19 Consolidation (2-8-0) locomotives, originally constructed for the Denver & Rio Grande in 1881. 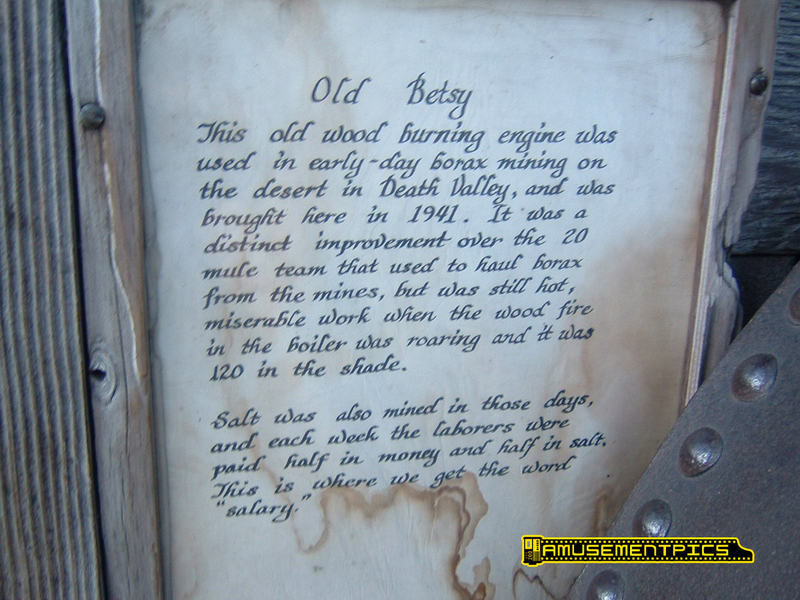 When retired from service in Colorado, No. 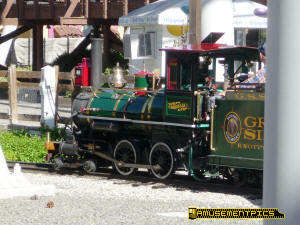 340 "Green River", the engine was renamed "Gold Nugget" and reassigned the No. 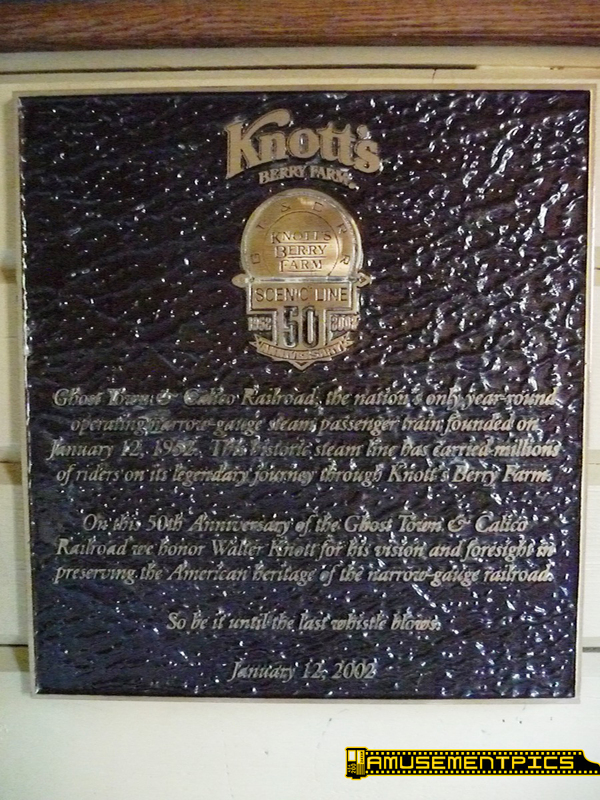 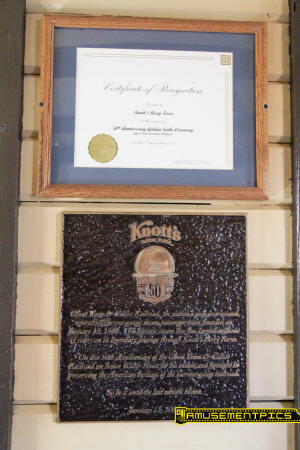 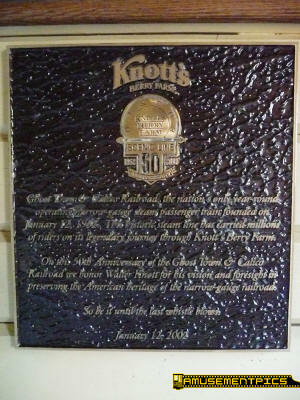 40 when acquired by Knott's. One of the two Class C-19 Consolidation (2-8-0) locomotives, originally constructed for the Denver & Rio Grande in 1881. Retired from service in Colorado, the engine was acquired by Knott's where it has operated as No. 41 "Red Cliff" (renamed "Walter K" at the 60th anniversary ceremony in January 2012). 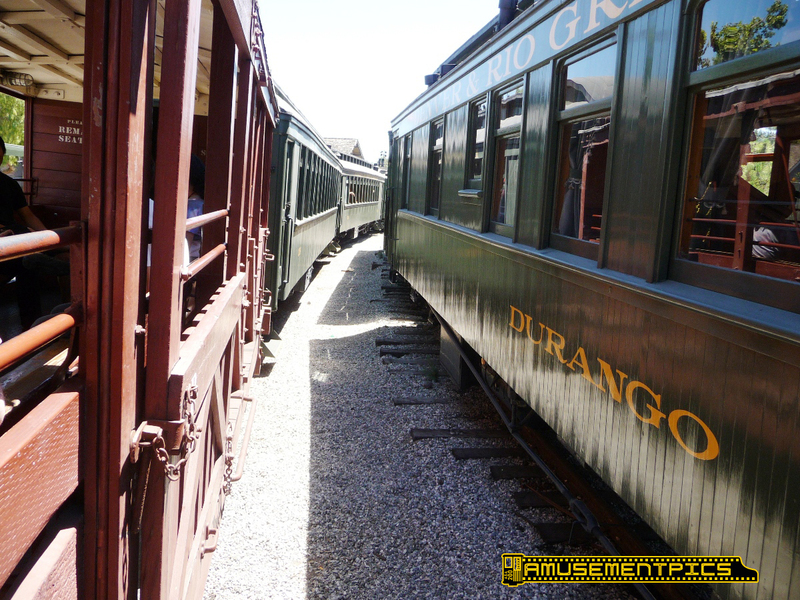 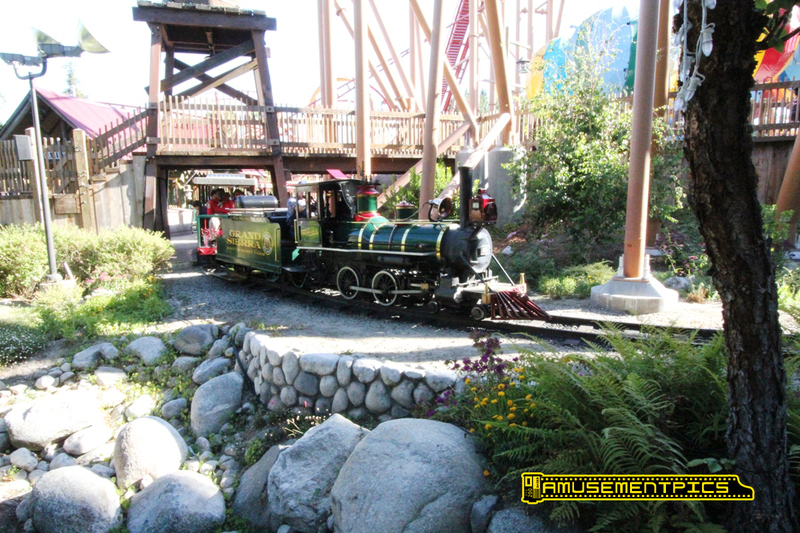 Walter Knott acquired two locomotives along with the Galloping Goose, several coaches and freight cars from the Denver & Rio Grande Western railway in Colorado to add a railway to the burgeoning theme park in the 1950's. 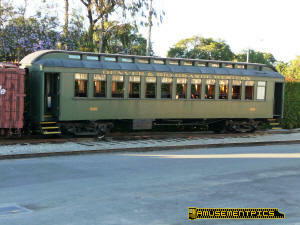 The cars are still in service and well maintained more than sixty years later. 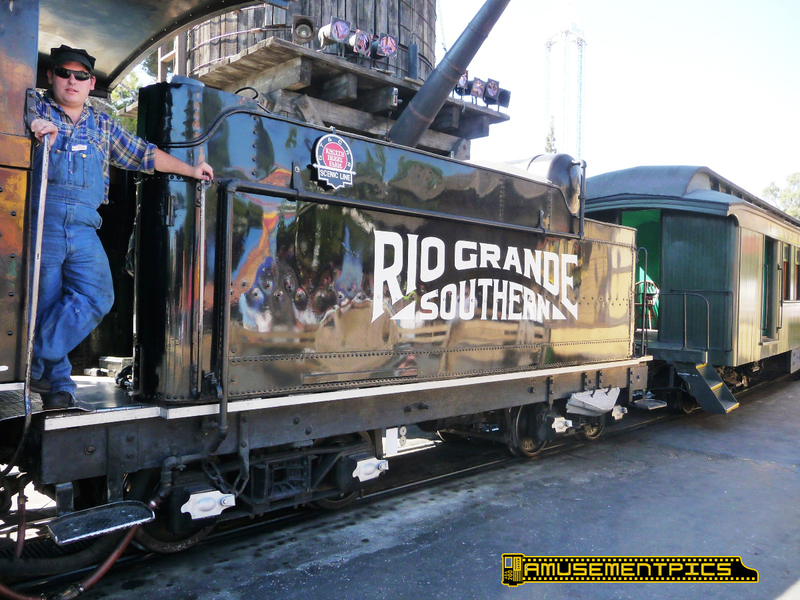 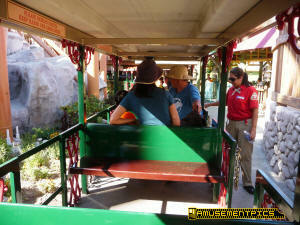 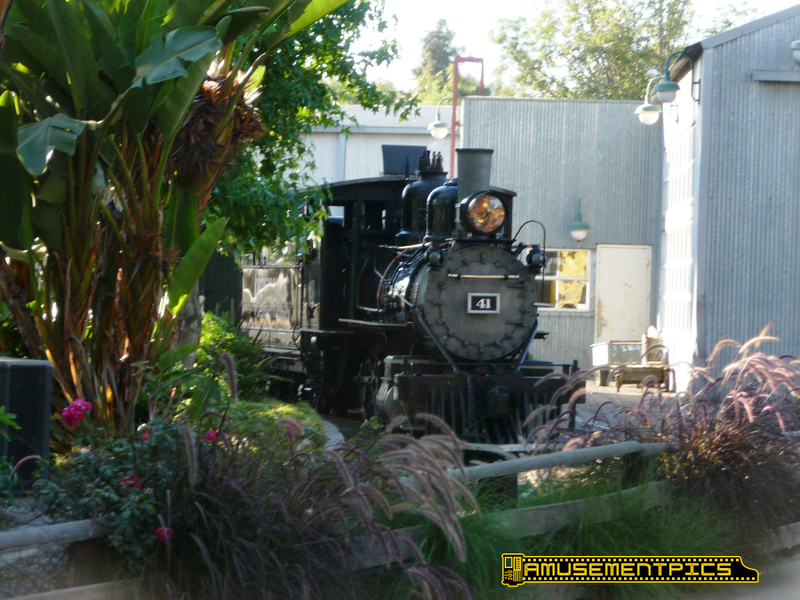 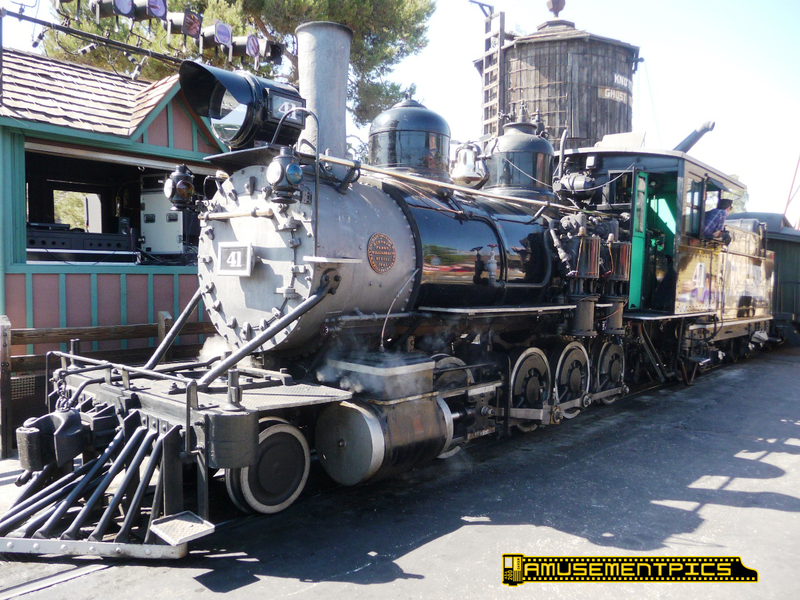 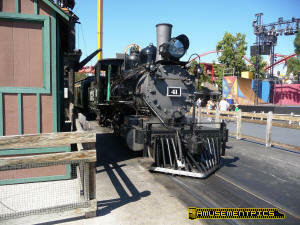 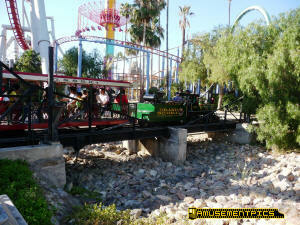 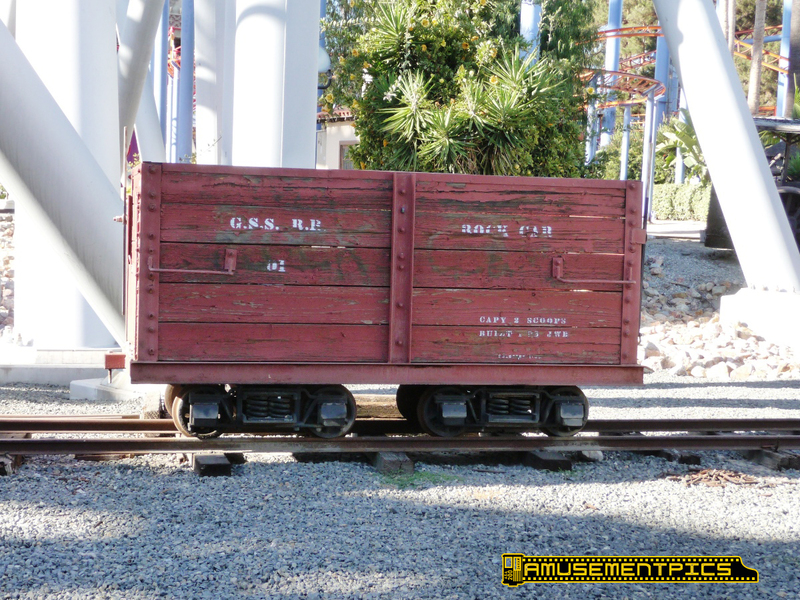 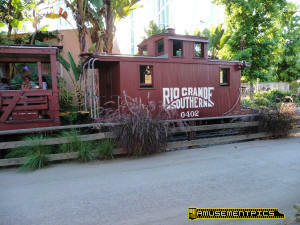 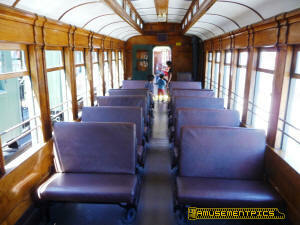 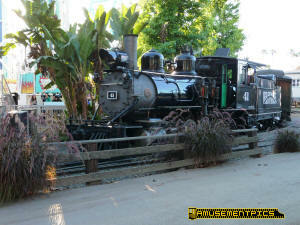 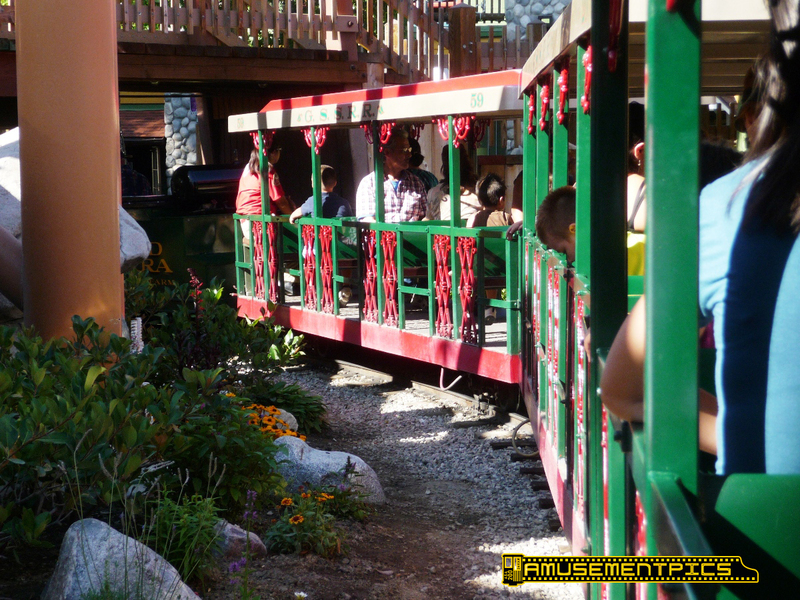 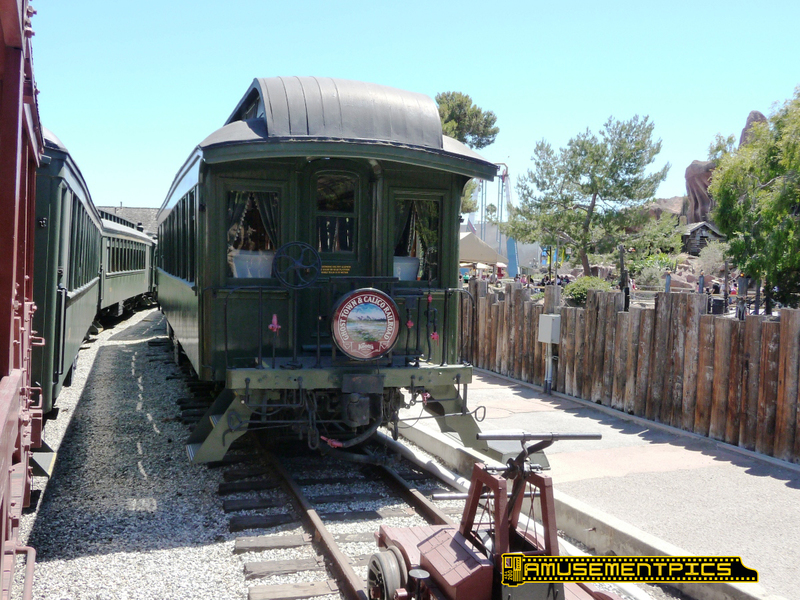 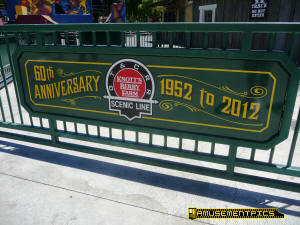 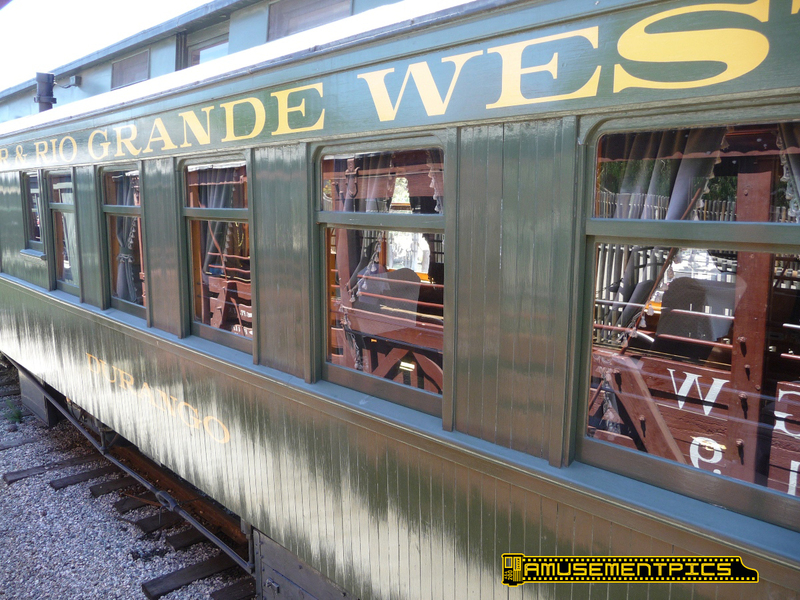 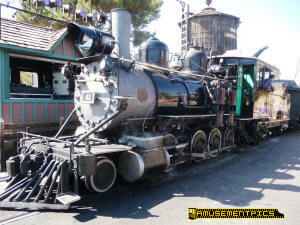 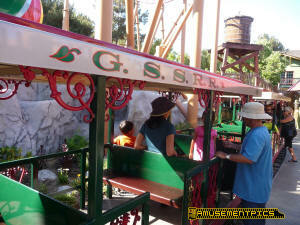 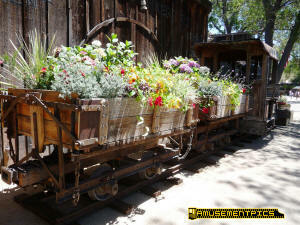 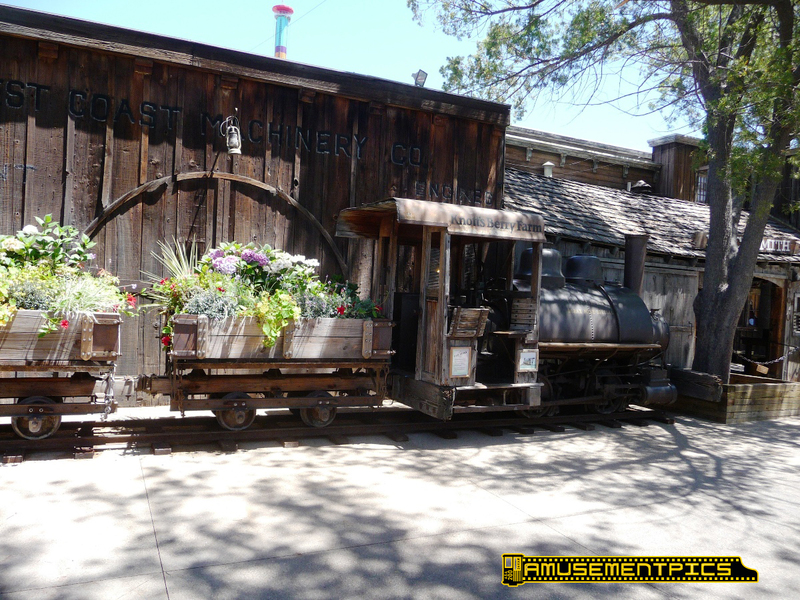 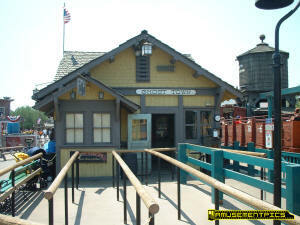 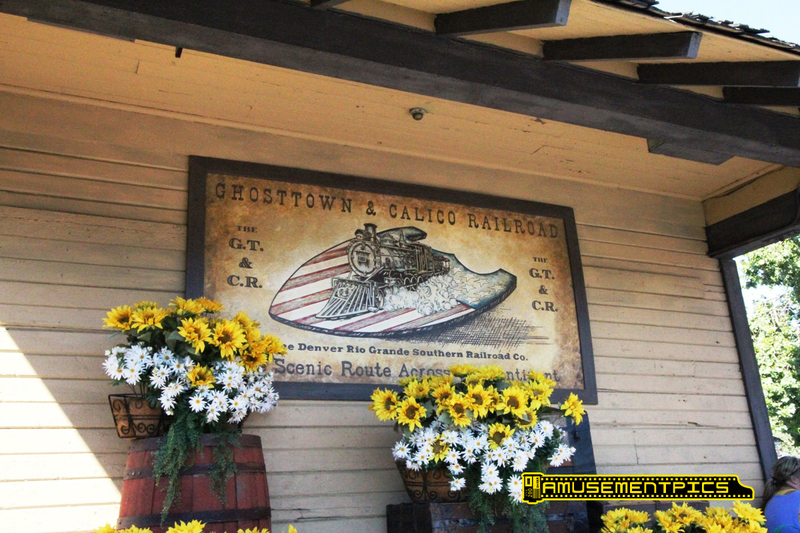 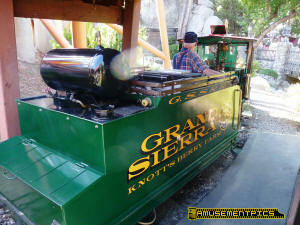 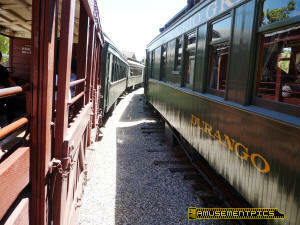 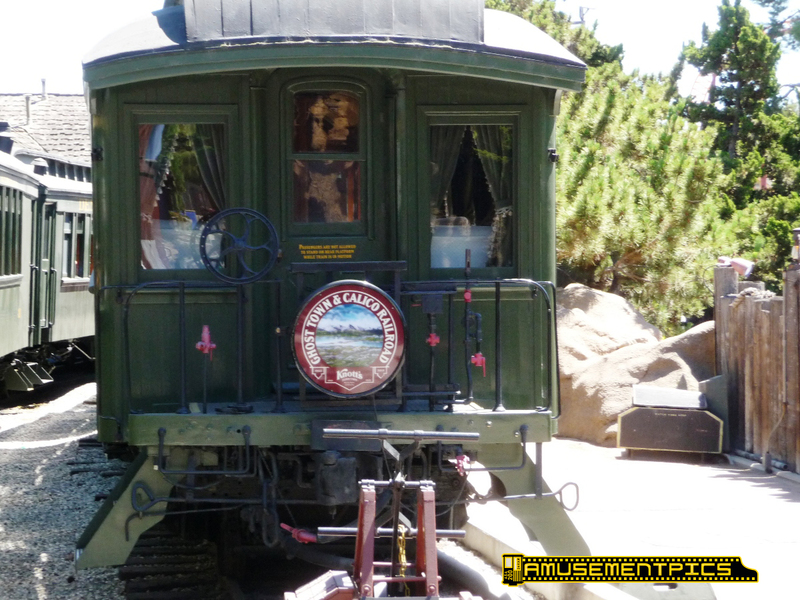 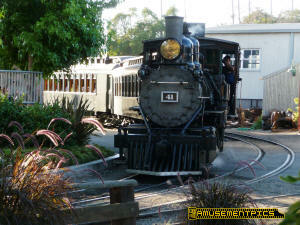 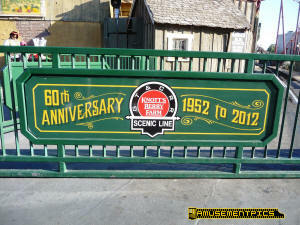 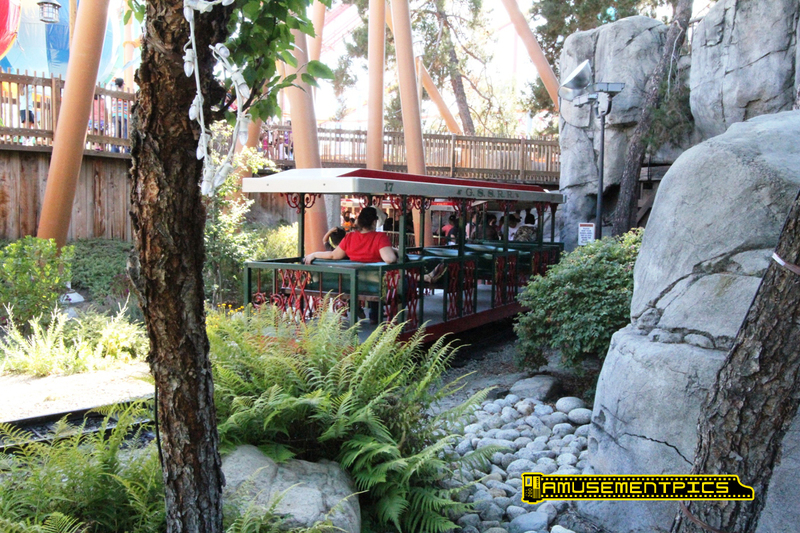 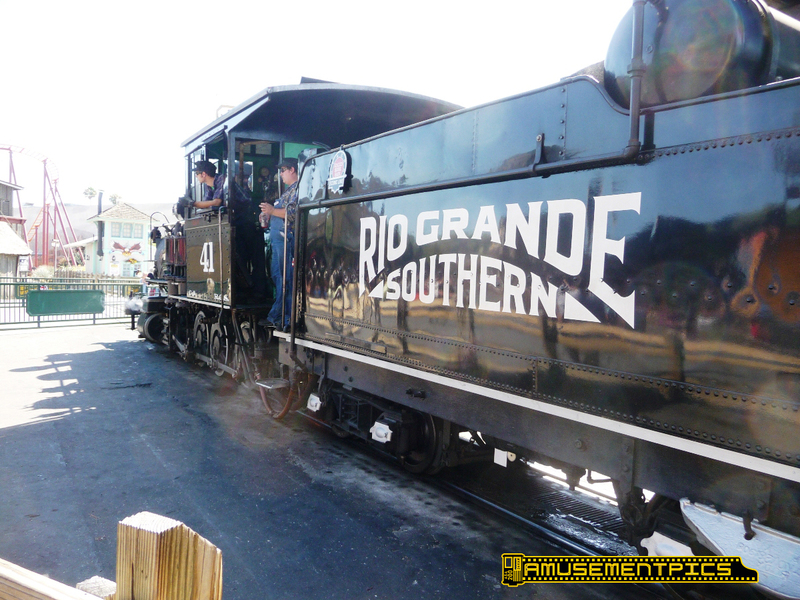 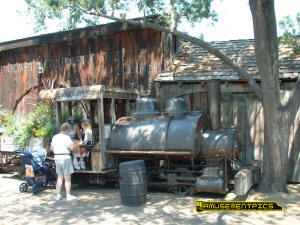 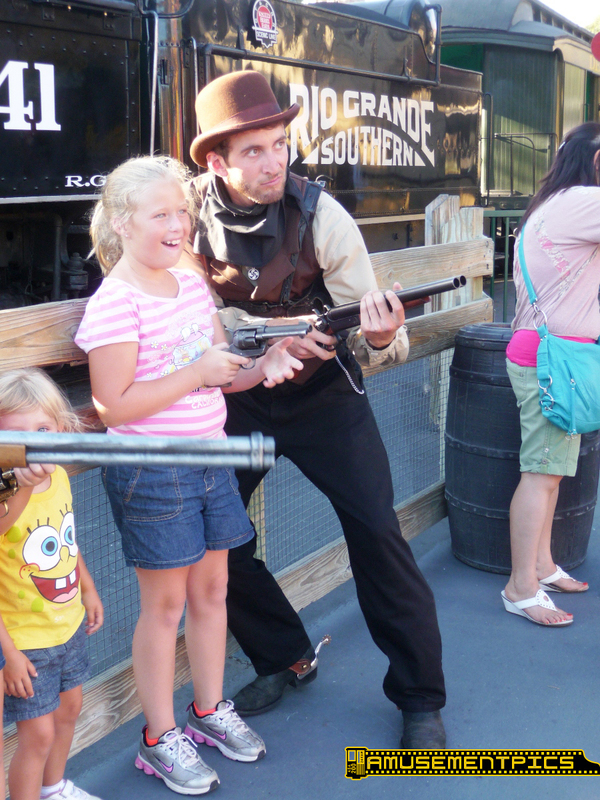 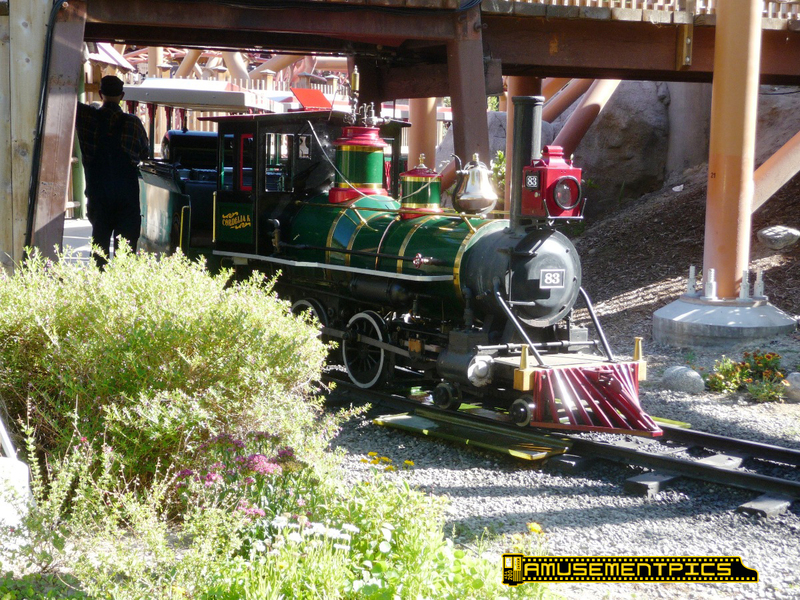 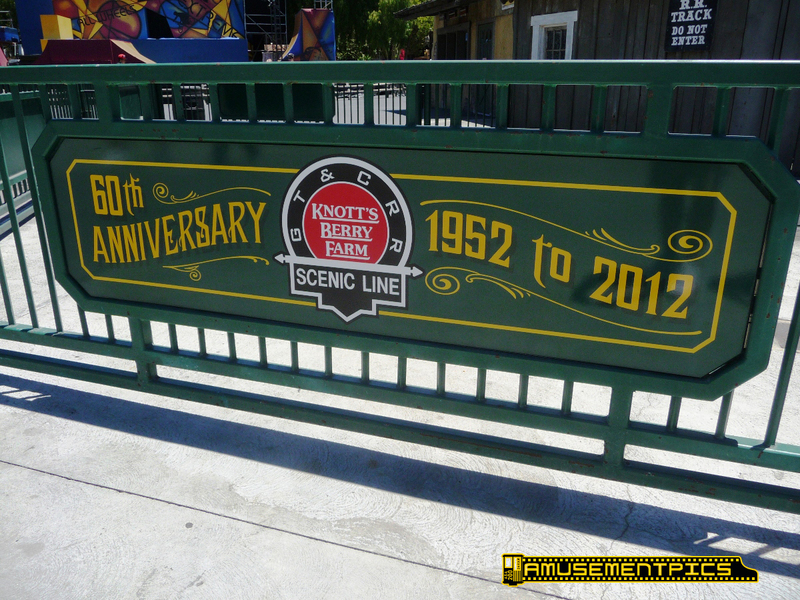 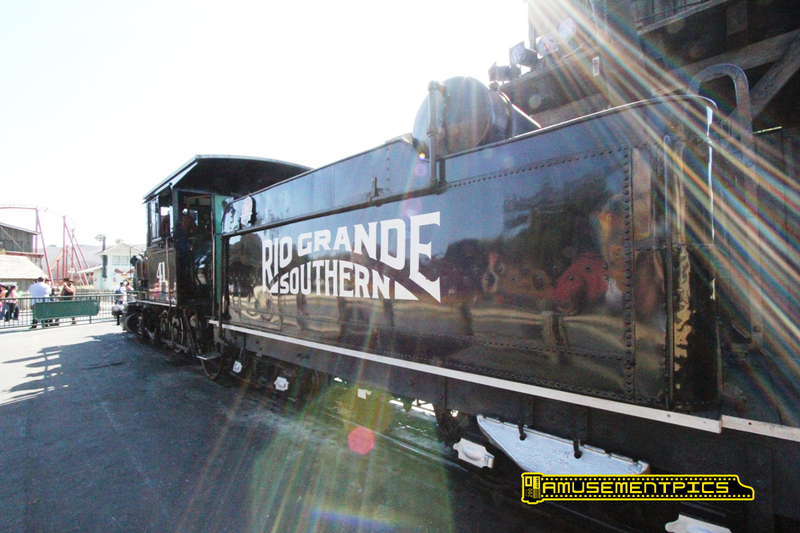 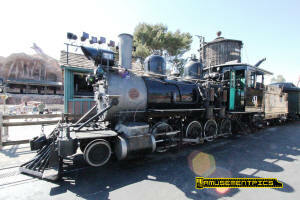 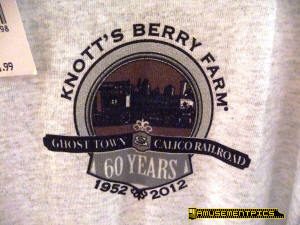 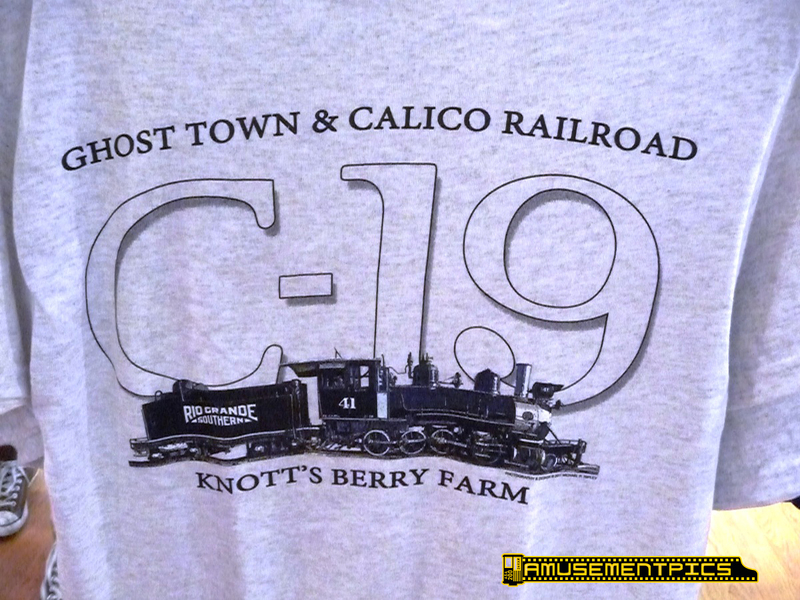 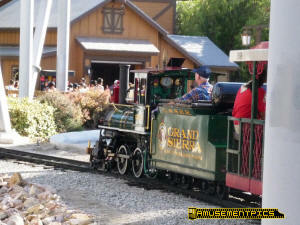 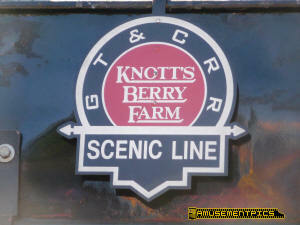 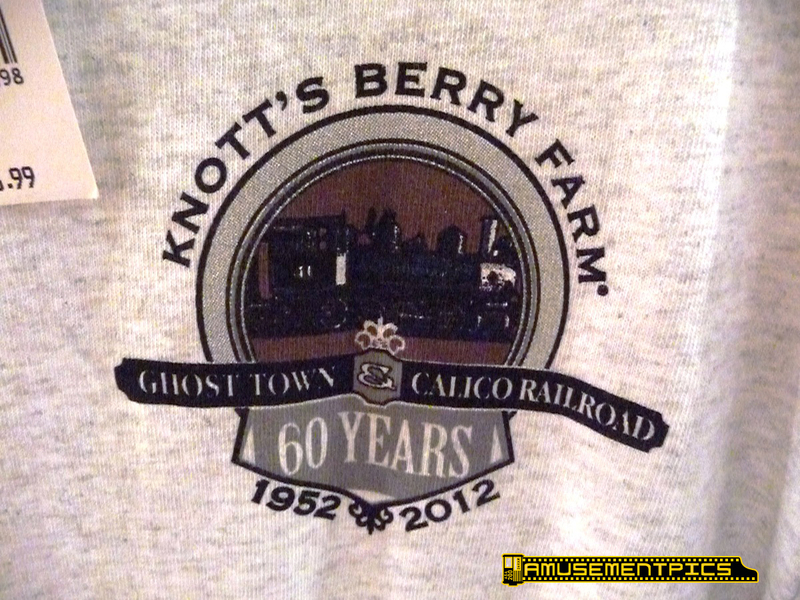 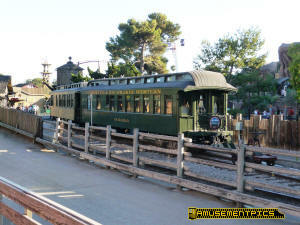 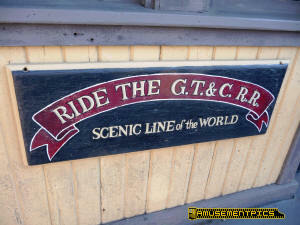 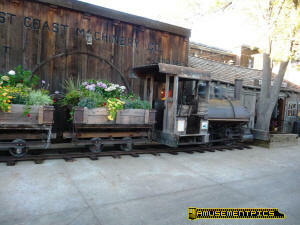 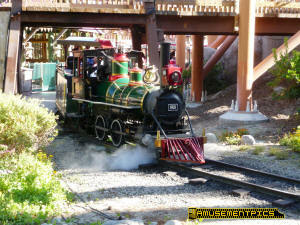 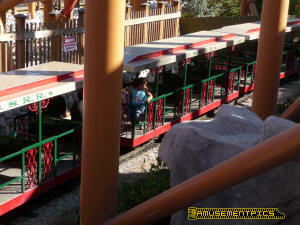 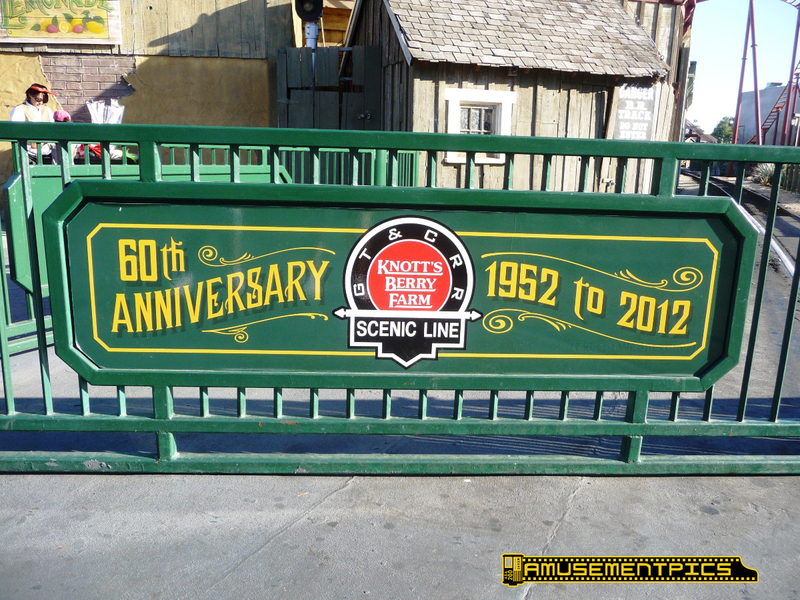 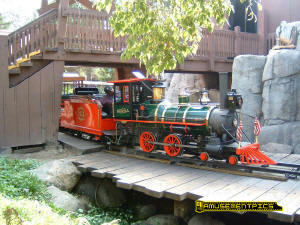 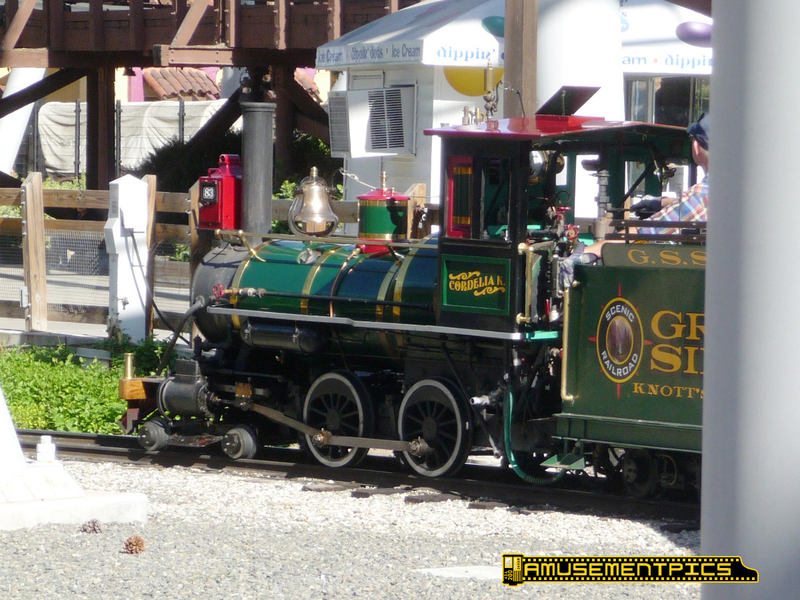 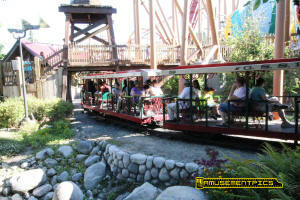 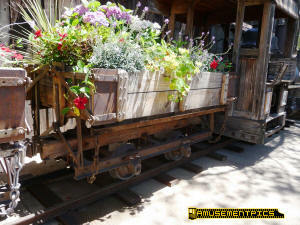 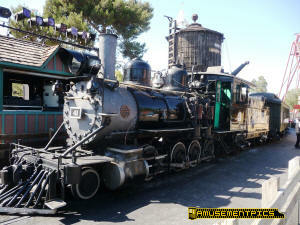 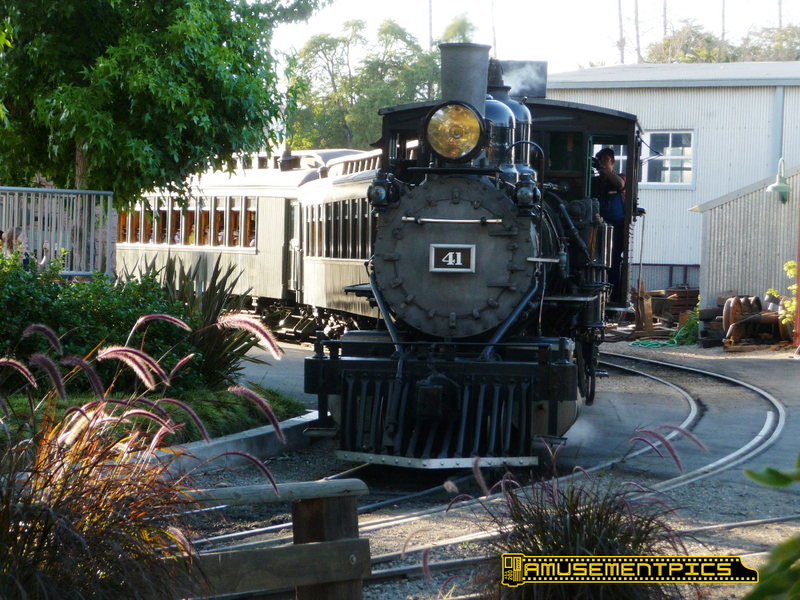 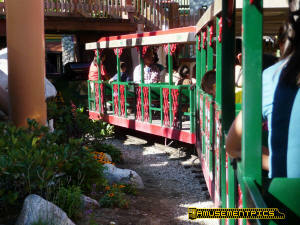 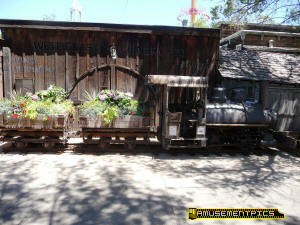 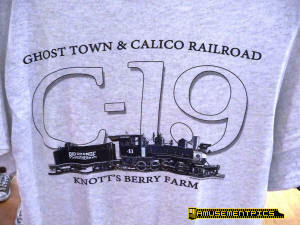 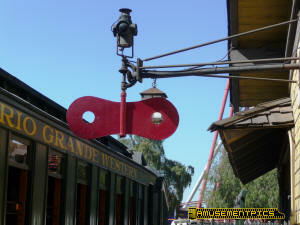 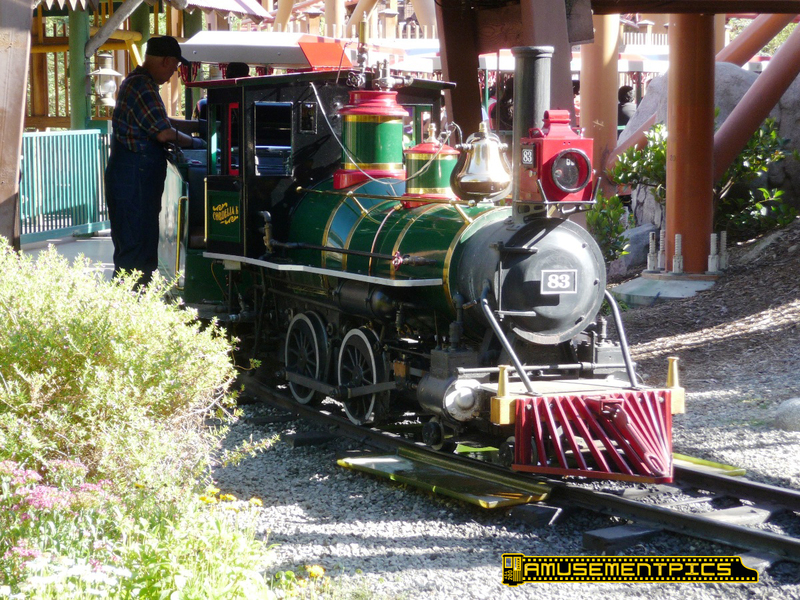 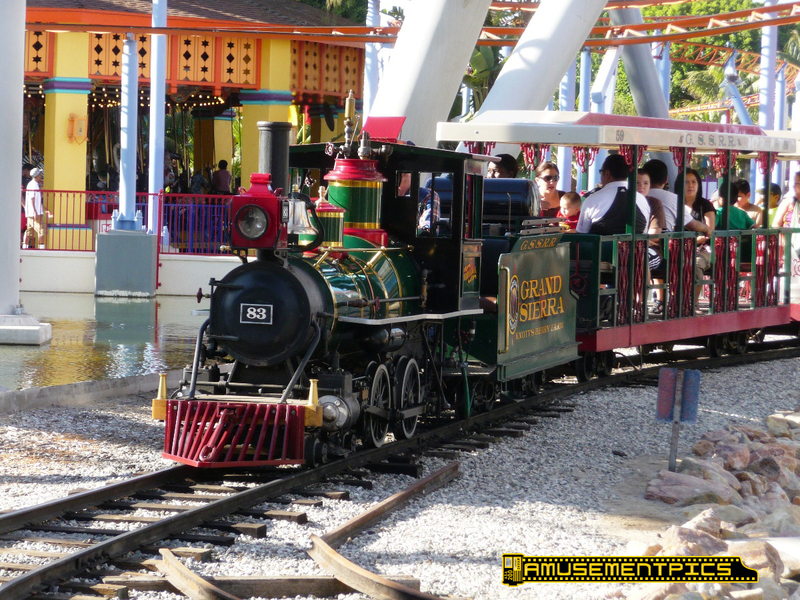 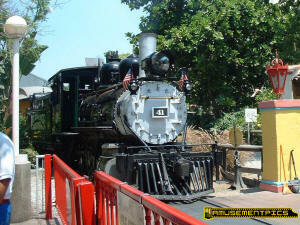 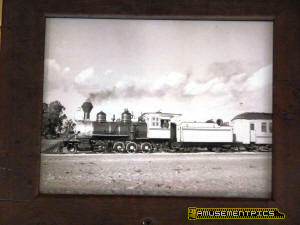 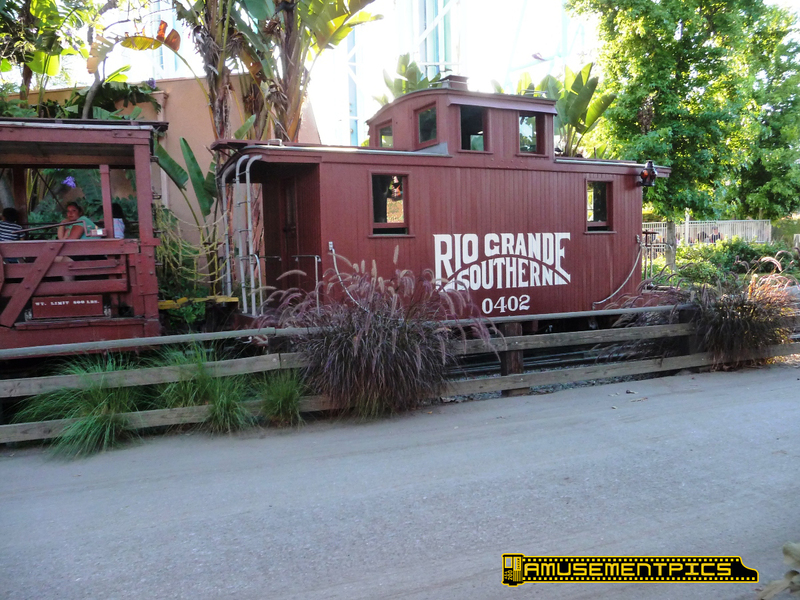 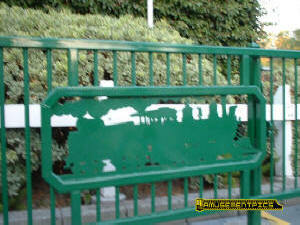 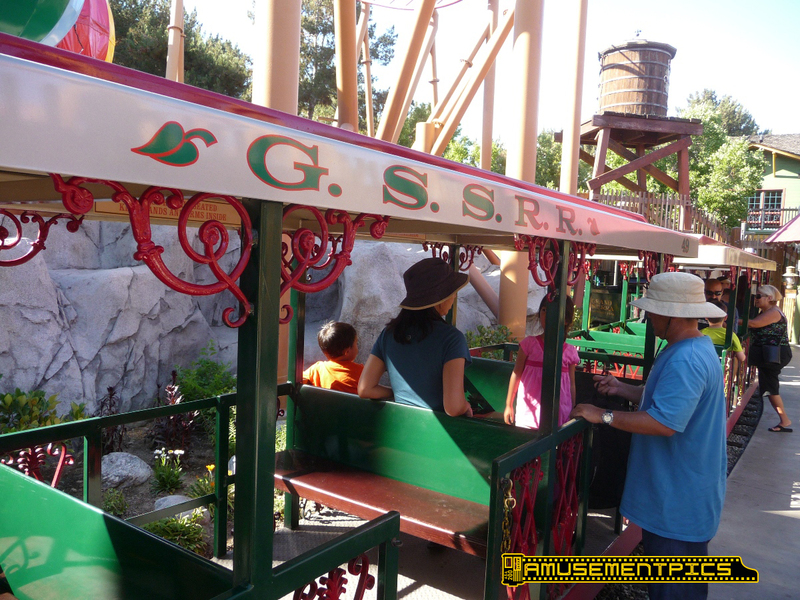 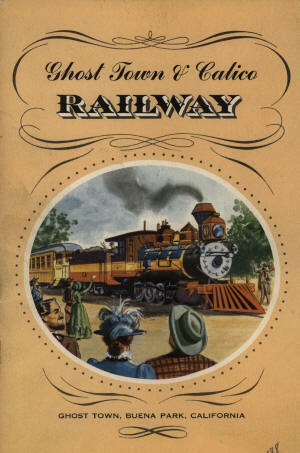 In addition to the Ghost Town & Calico, Knott's also operates the Grand Sierra Scenic Rail Road. 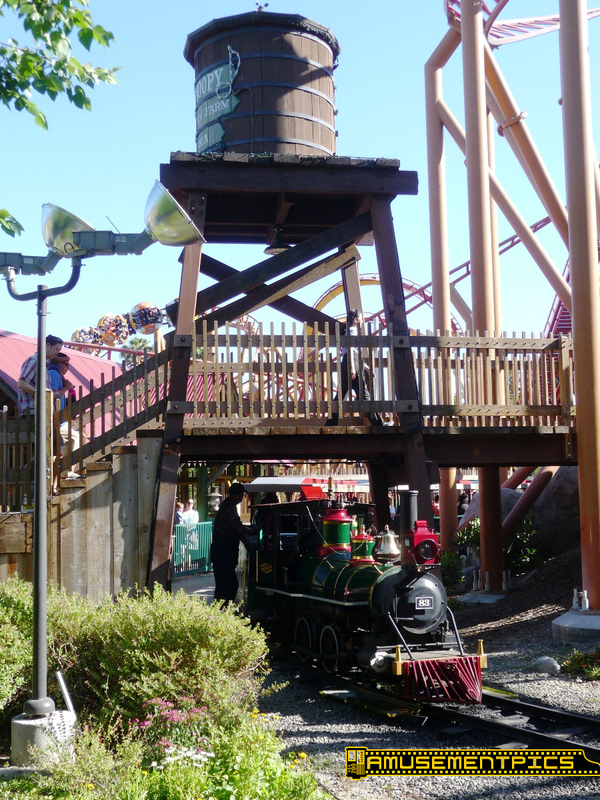 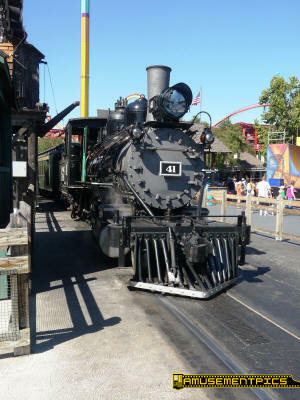 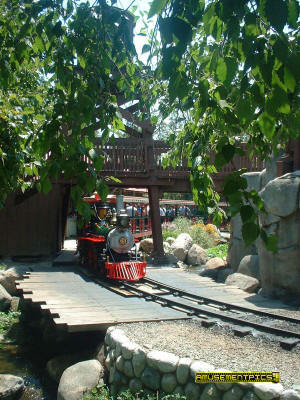 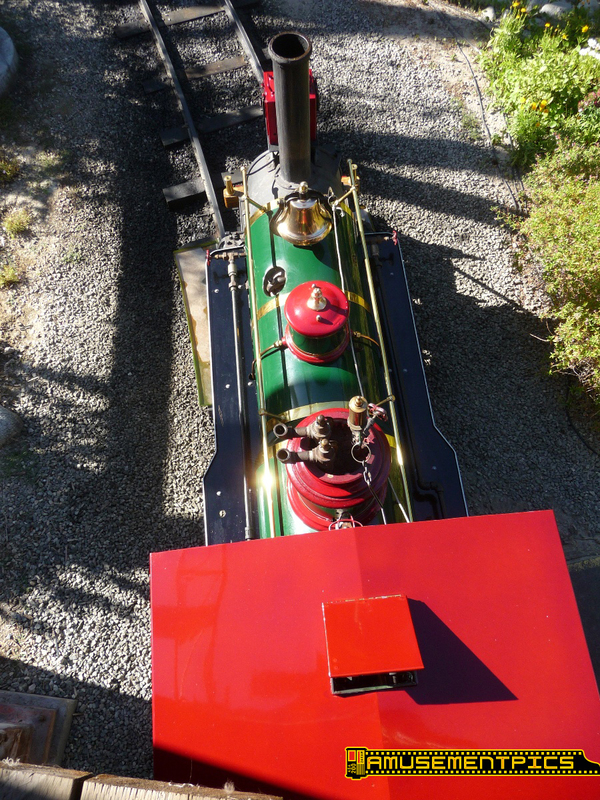 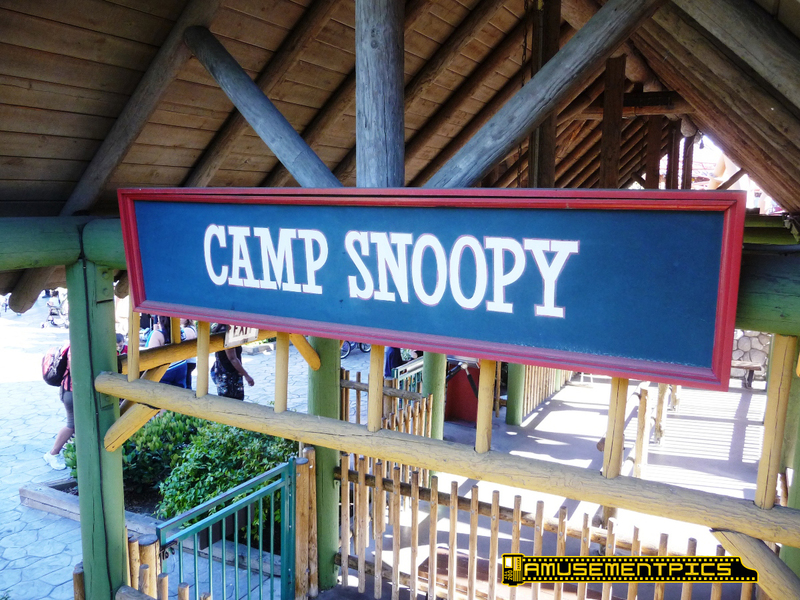 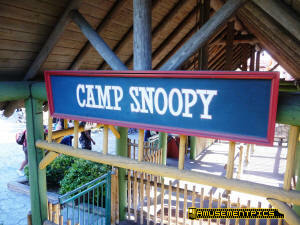 The two-foot gauge line operates as part of the Camp Snoopy childrens area, operating a live steam crown locomotive around a small loop. 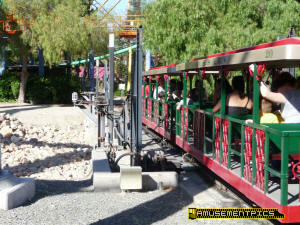 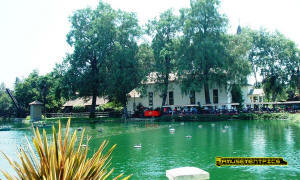 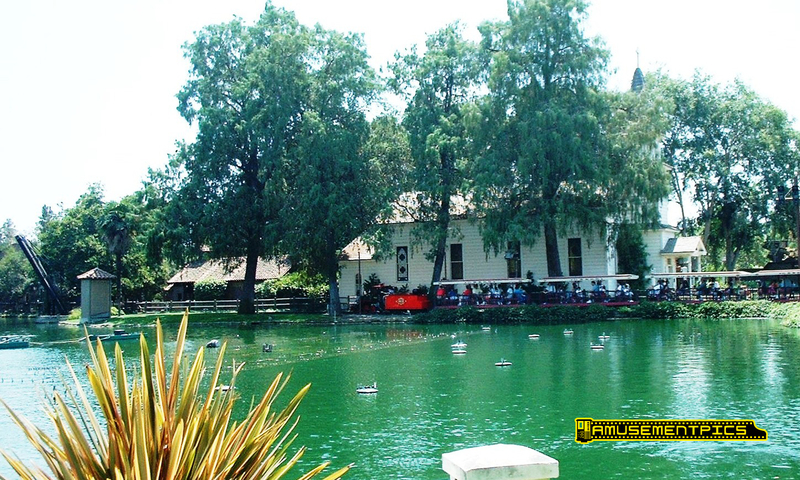 The train once circled a fairly large lake which was partially filled over time as new attractions were added. 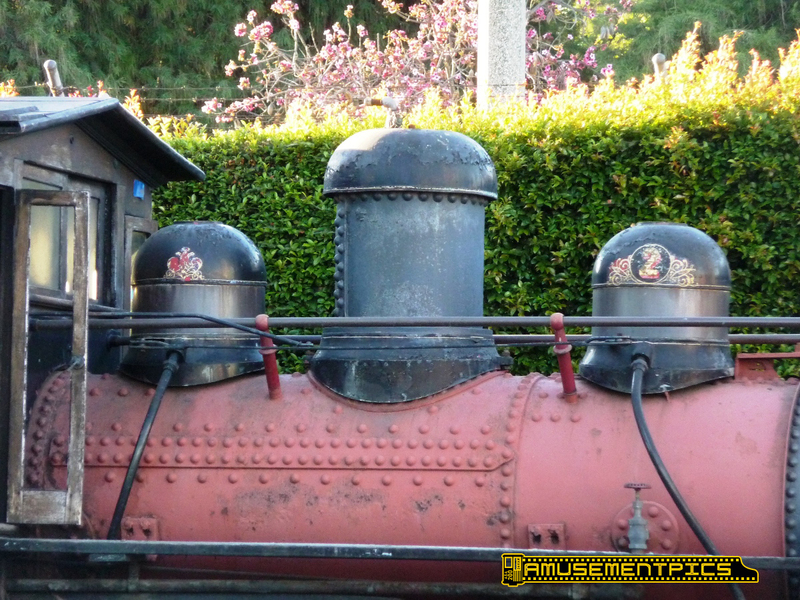 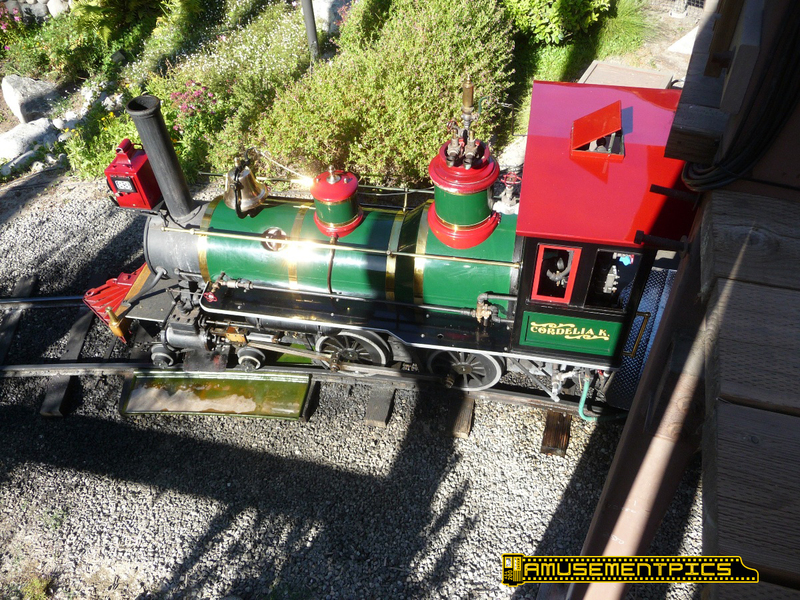 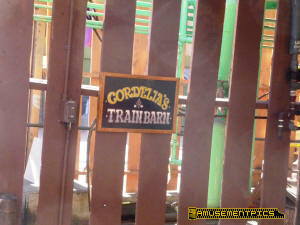 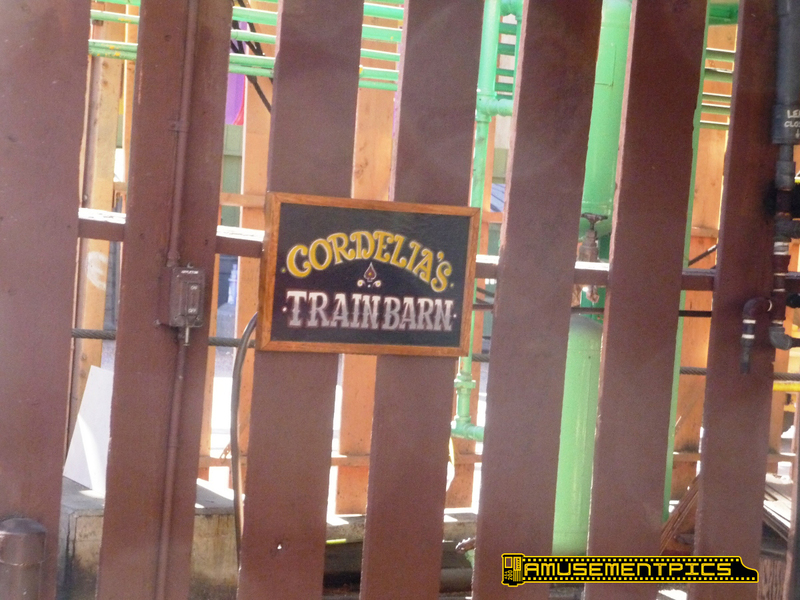 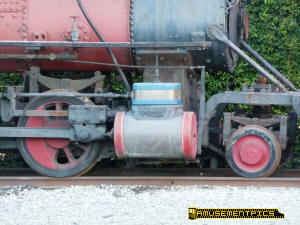 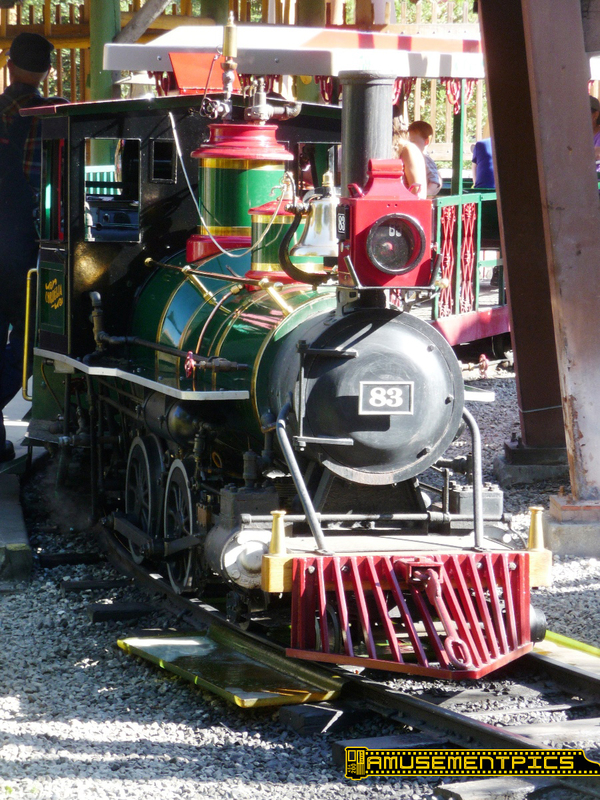 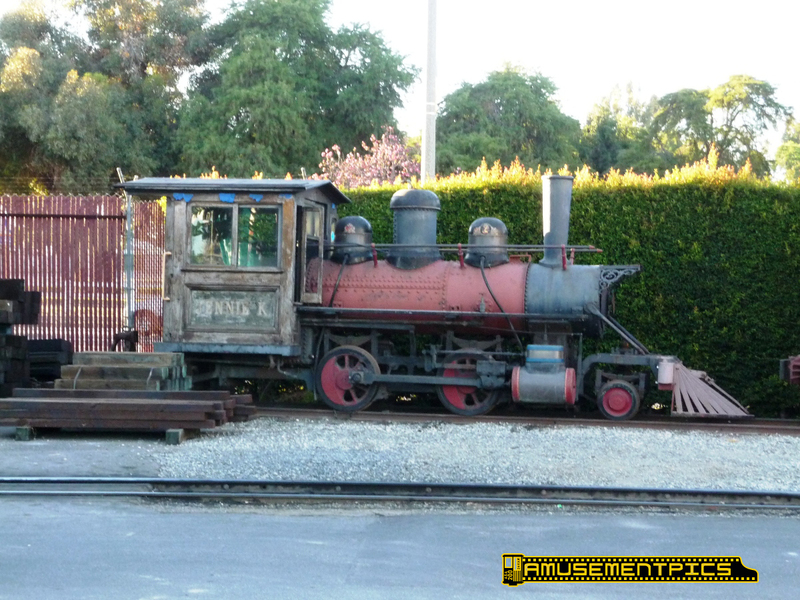 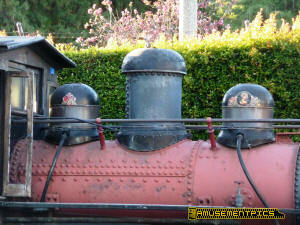 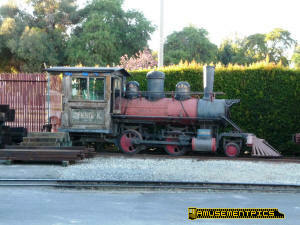 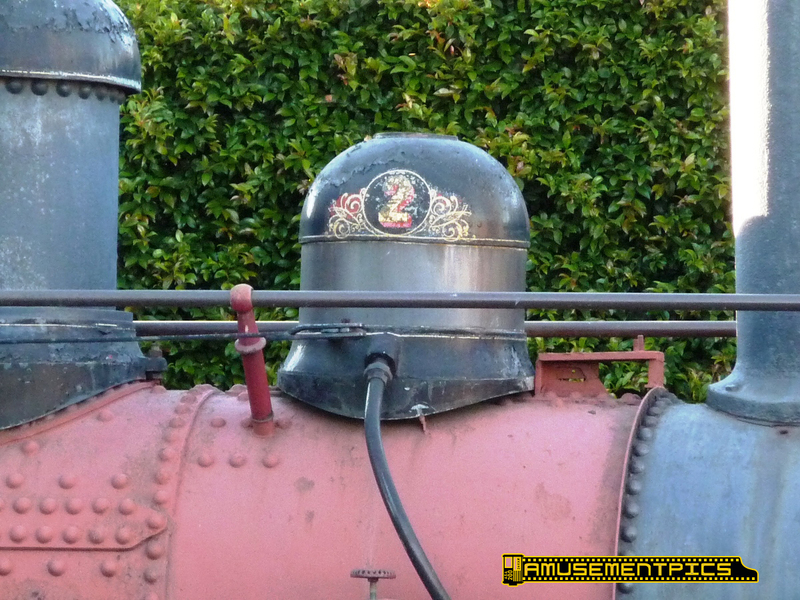 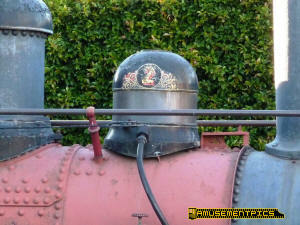 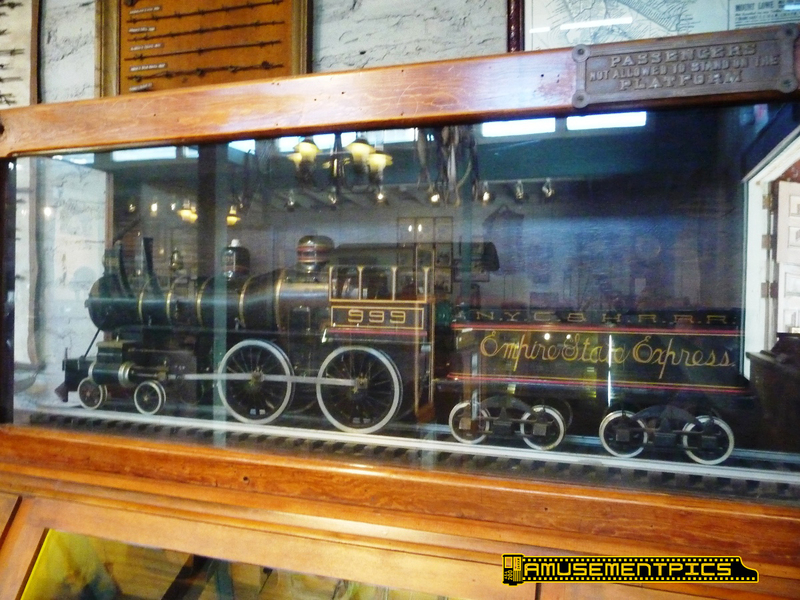 The "Little Toot" model crown locomotive was purchased by Knott's in 1982 and named for Cordelia Knott. 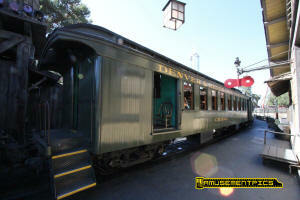 The train consists of four of Crown's standard covered steel coaches. 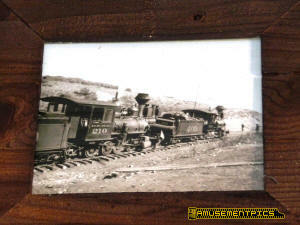 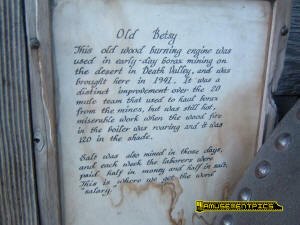 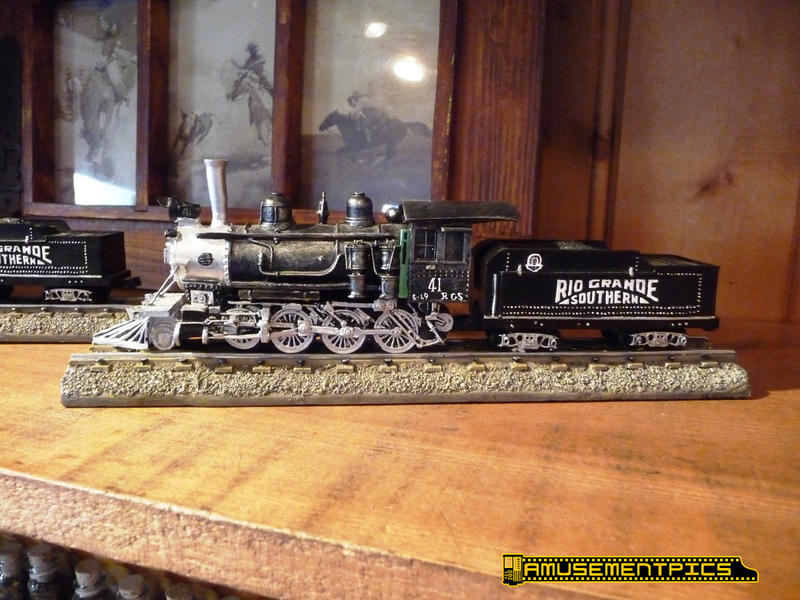 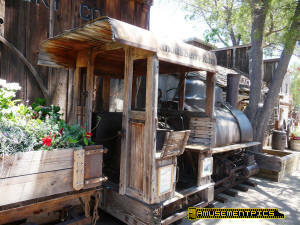 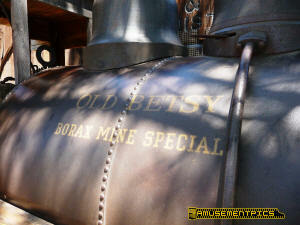 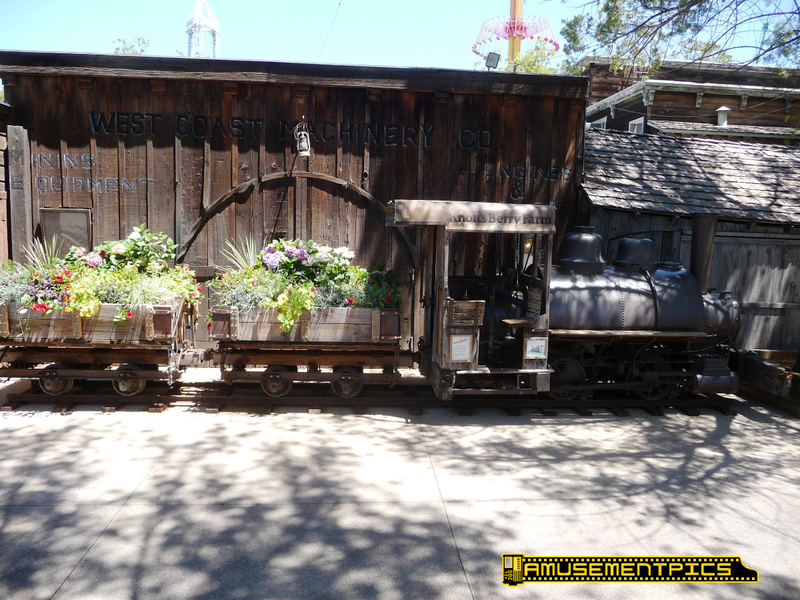 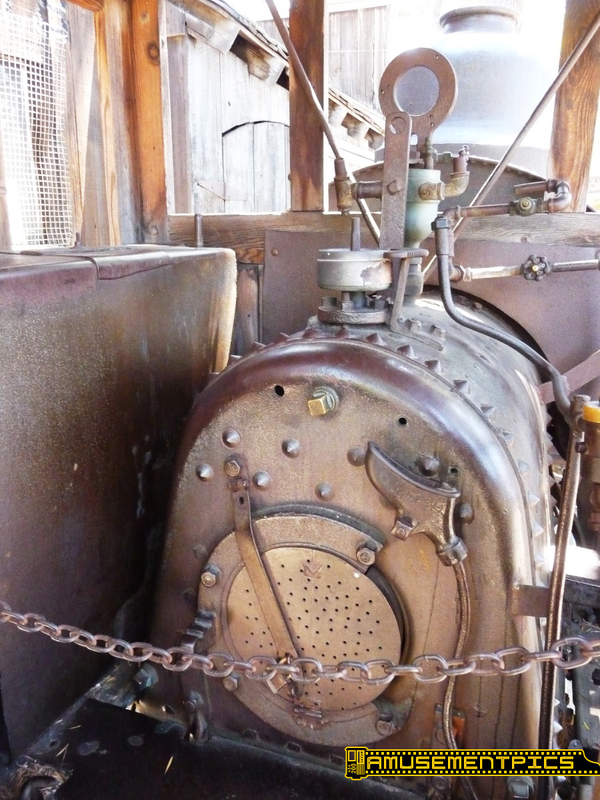 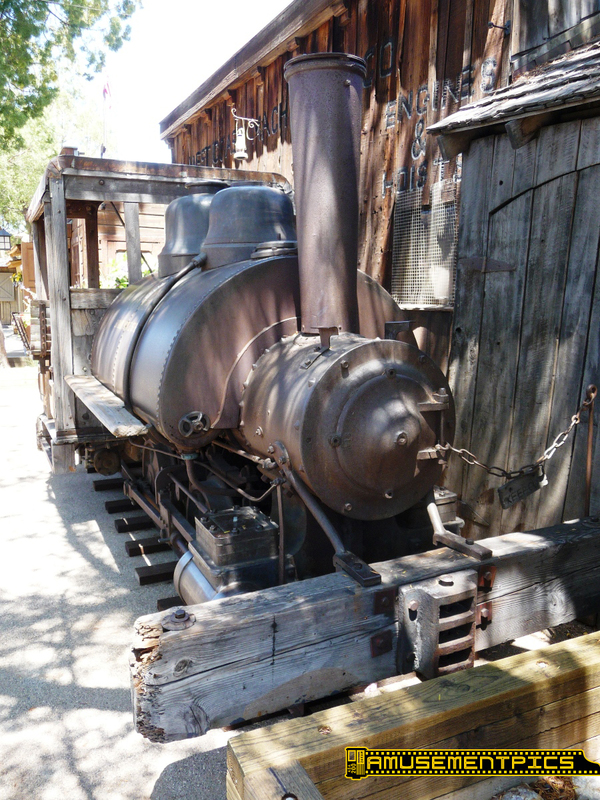 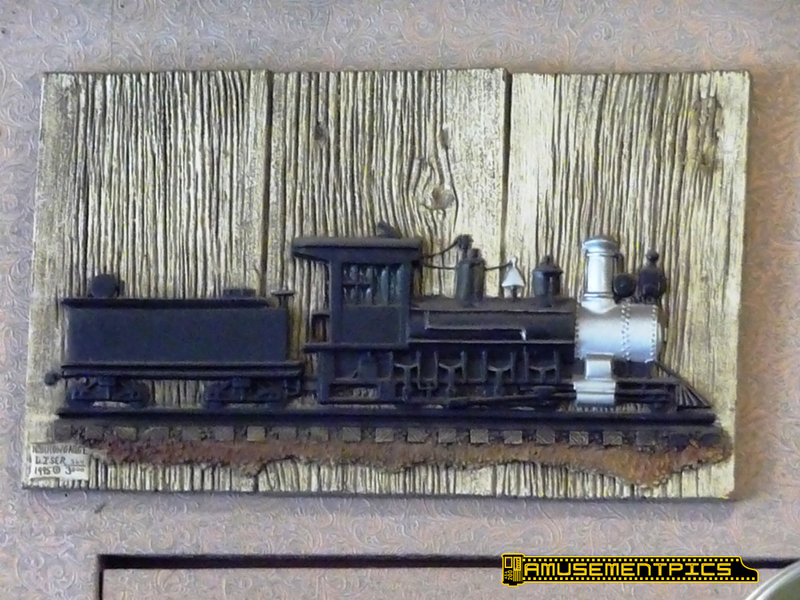 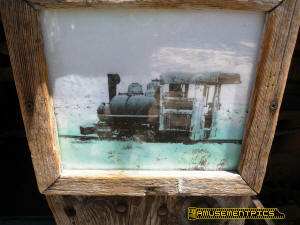 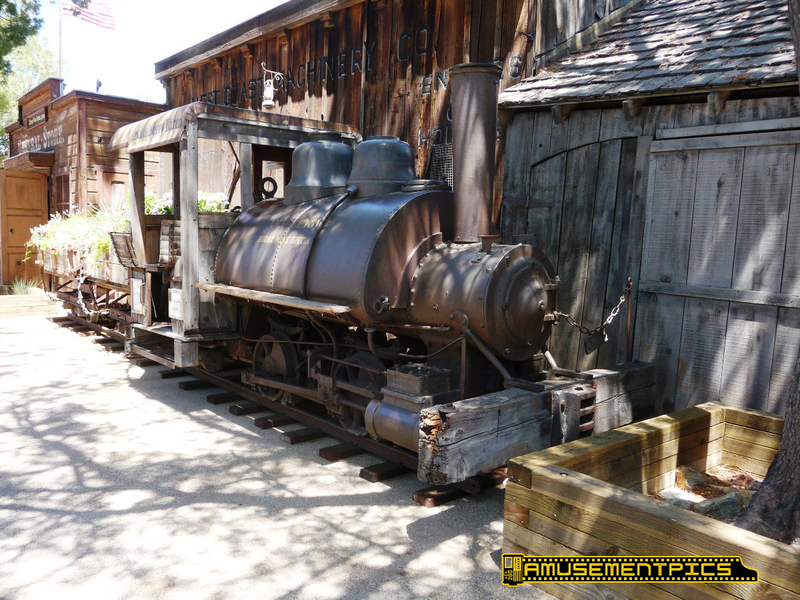 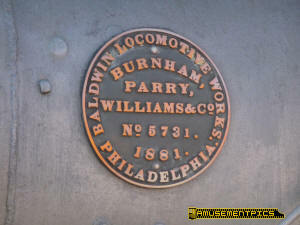 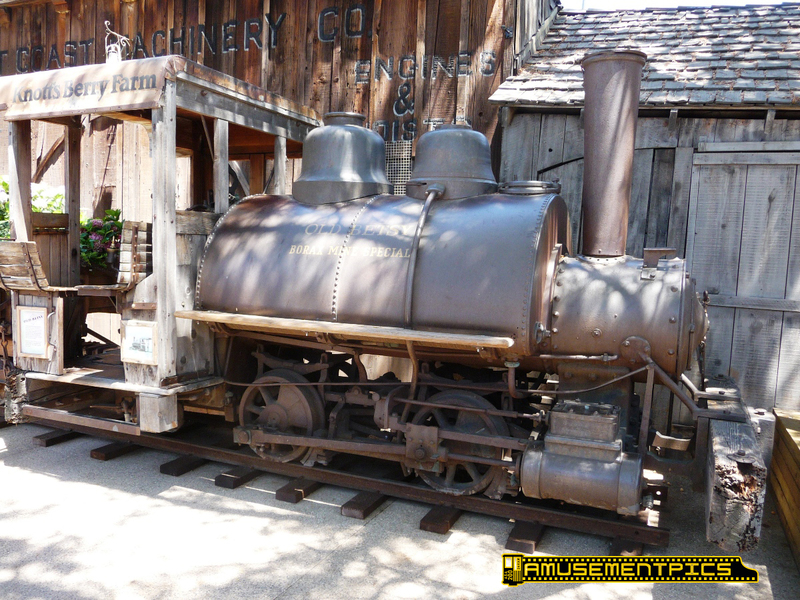 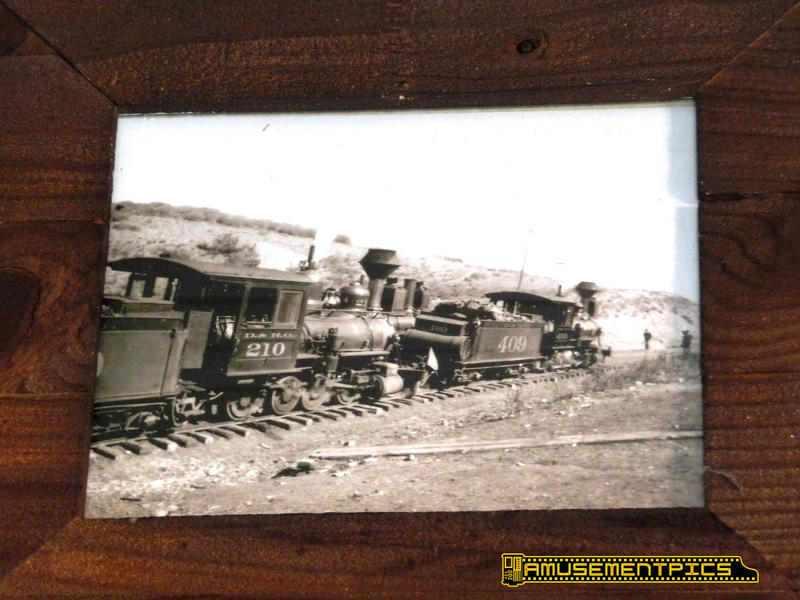 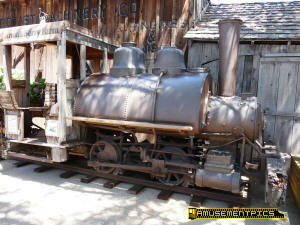 The 24" gauge wood burning locomotive was built in 1906 by Vulcan, and operated in the borax and salt mines of the California deserts until it was purchased by Knott's in 1941 where it became a display piece in the Ghost Town area of the park.